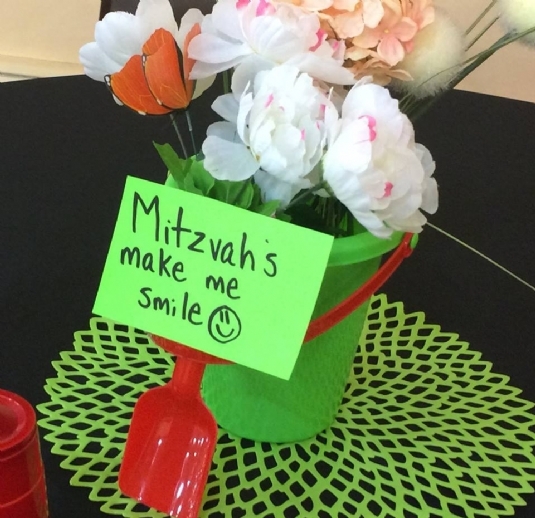 Membership Renewal and Seat Selection New Membership Form and Seat Selection Seat Reservations High Holiday Seating Map Schedule of Services High Holidays with Rabbi B! 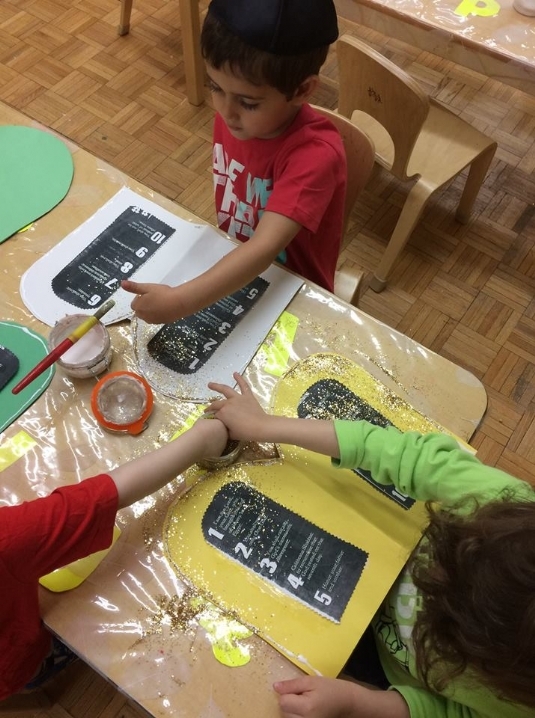 This week we celebrated Tu’Bshevat and learned all about trees! 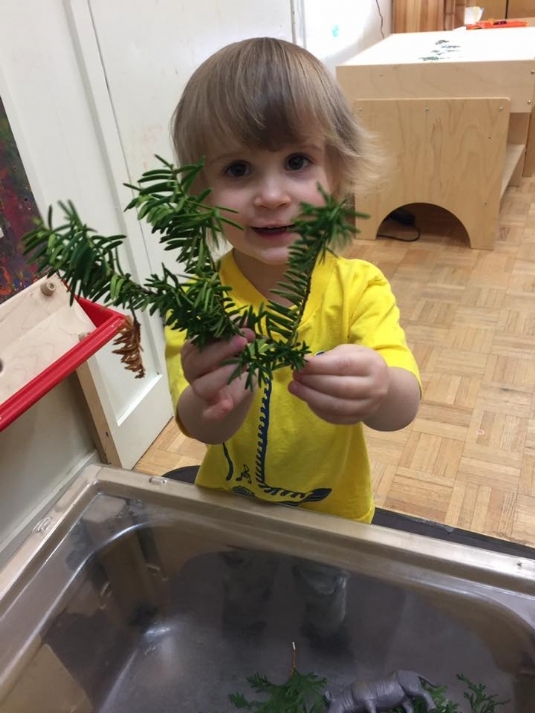 The classes explored what kinds of foods we get from trees, and the different things that come from them, such as sticks, acorns, pinecones and leave. 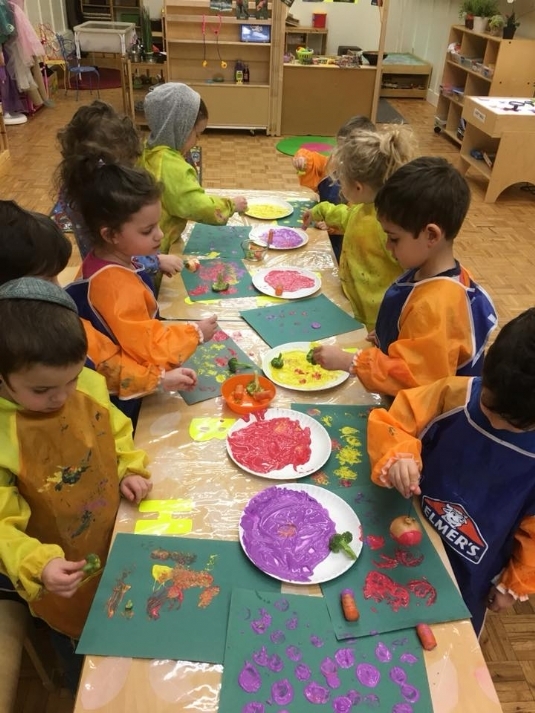 They also spent time talking about the differences between the trees here around us, and the trees in Israel, and got to make visuals of how the trees look different. 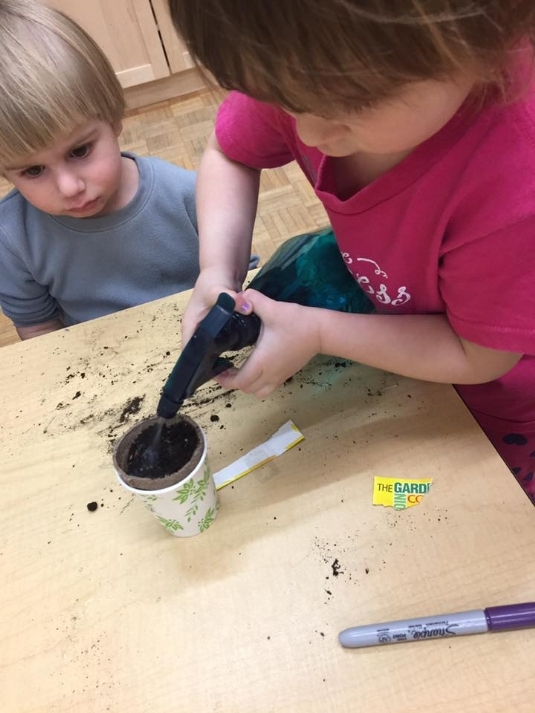 The Nitzanim class planted seeds in cups with soil while the Perachim class got to plant beans in little baggies. 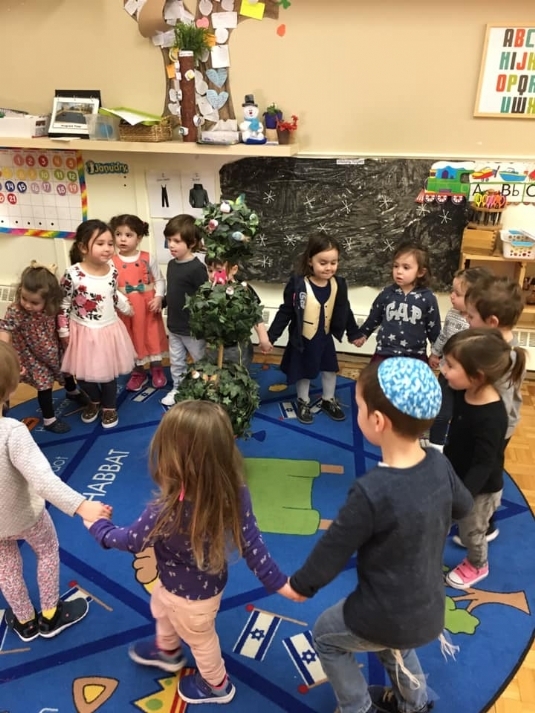 The children enjoyed dancing around the trees in their classes, singing happy birthday in Hebrew and in English. 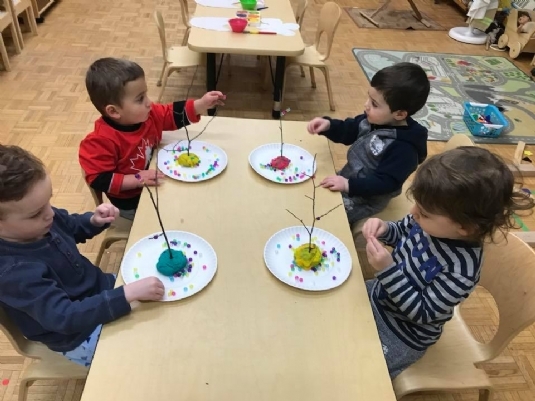 They also got to taste some of the fruits that come from the tree’s in Israel during a special Tu’Bshevat Seder that we all enjoyed for snack. 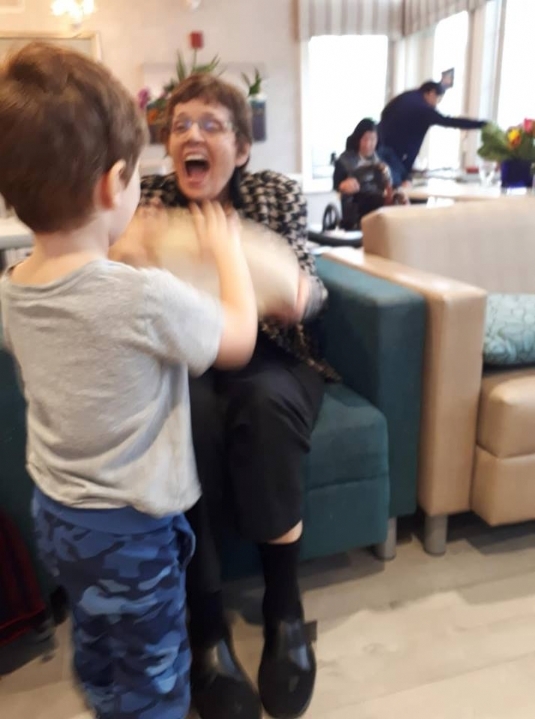 This week we had a very special visitor…. A fire fighter! 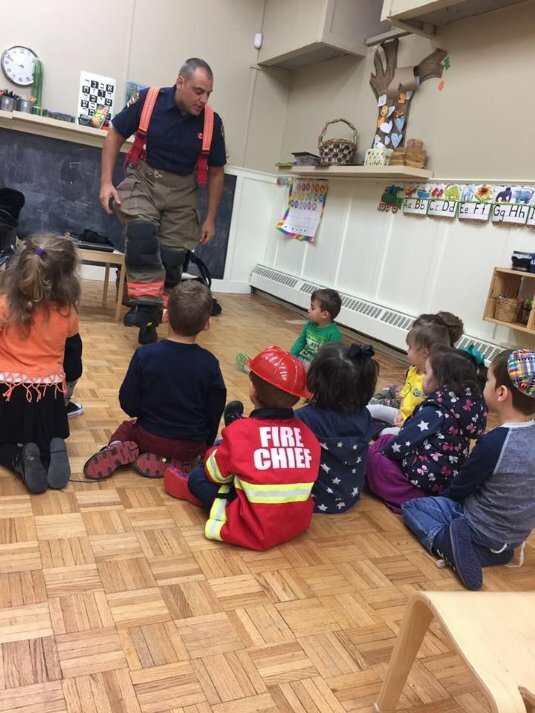 Fire Fighter Luigi came to talk to us about fire safety! She showed us a video and put on his protective fire-fighting gear so that we know the fire fighters are not scary and are there to help us! 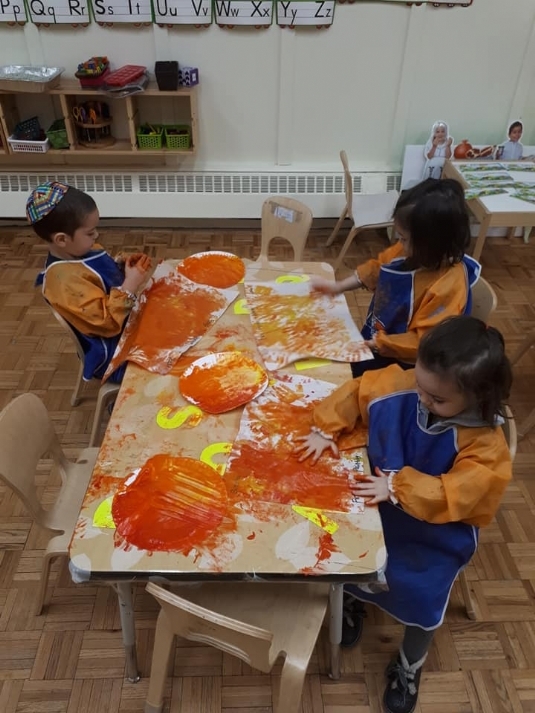 The Nitzanim class focused all about the letter F this week and used fine gross motor skills to spray water on to a 'fire'. 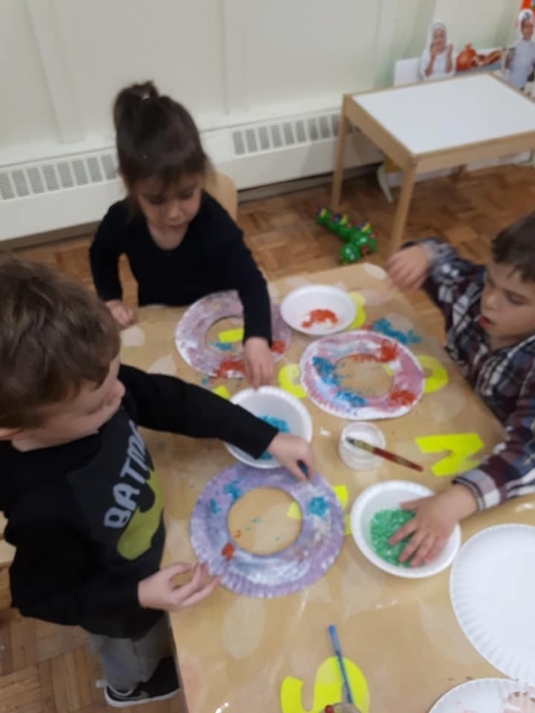 For creative arts some of the children coloured firefighter hats, some painted with fish, others coloured firetruck pictures, some glued and glittered paper plates to make rainbow fish, and we all glued parts of a flower on to paper. The sensory bin was filled with frogs on lily pads. It also had fishies in blue rocks that the kids loved. Our block centre was a big fish pond! 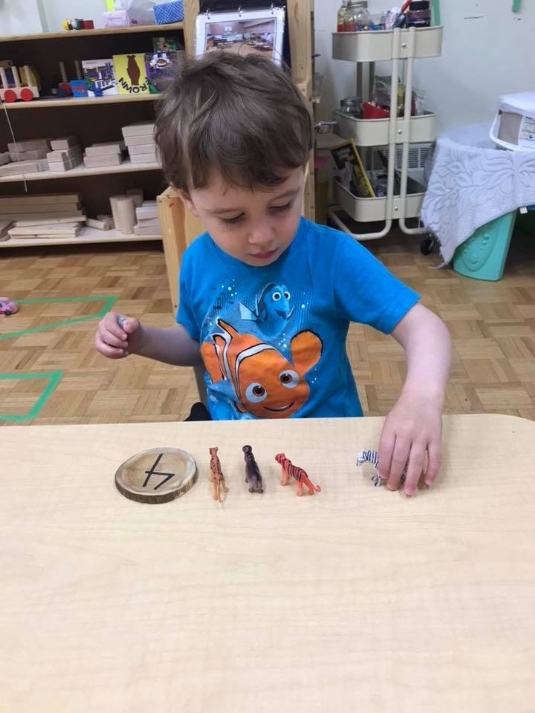 For fine gross motor they peeled stickers and placed them in circles on a fish. The drama centre was a beautiful flower market!! 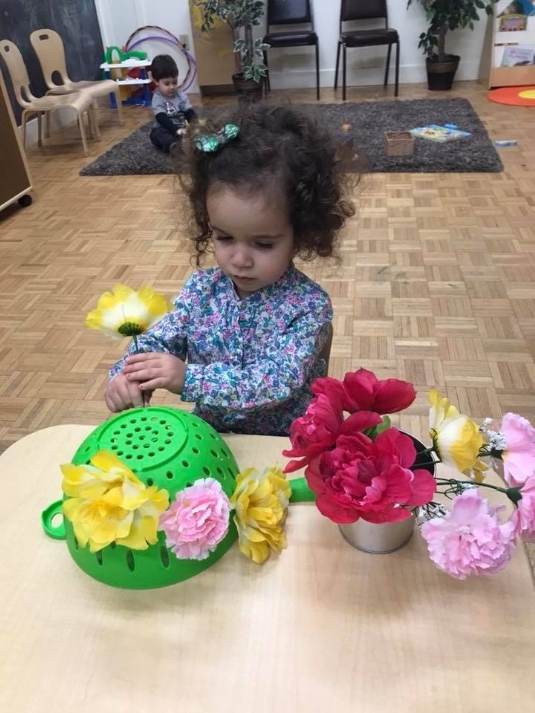 They used fine gross motor skills to put flowers through strainer holes, and peeled flower stickers to place inside a letter F. The children also loved the light table which had flower petals and flowers. 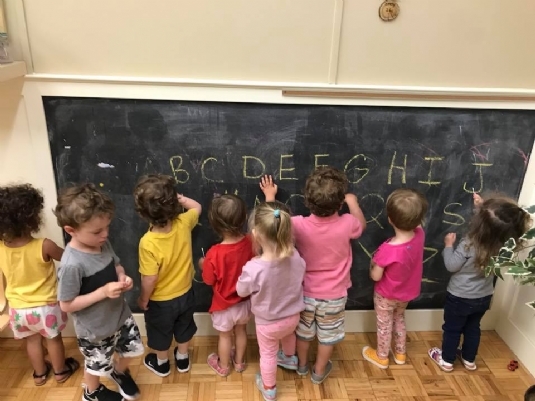 The Perachim class focused on transportation and the letter E this week. 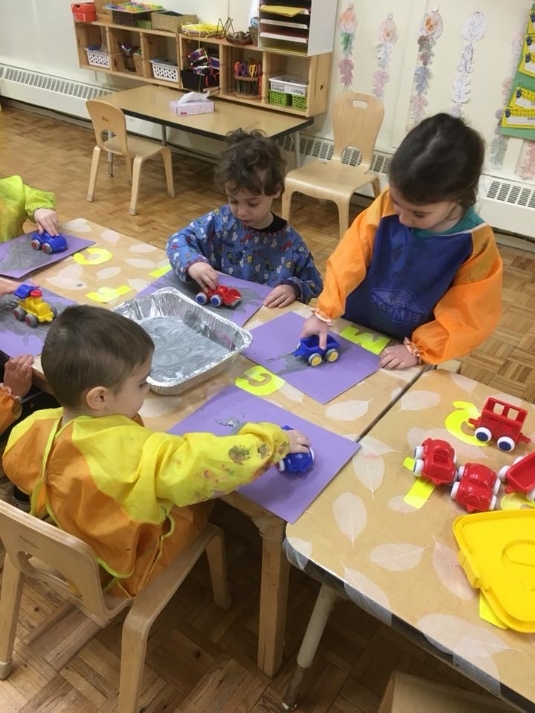 The students made their own fire trucks using different materials, and finger-painted fire! They also did a sorting assignment called 'Hot or Not Hot' in which the students had to divide items into either category after learning if certain things are hot. 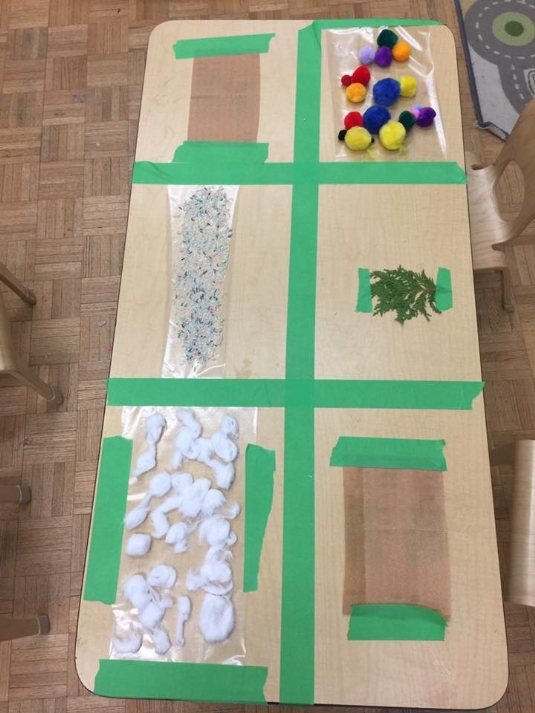 The students made a very elaborate and impressive train track by working together as a team, and they also did art by driving cars through paint. They learned about the letter E with mat man, and everyone got to build their own letter E’s with blocks. 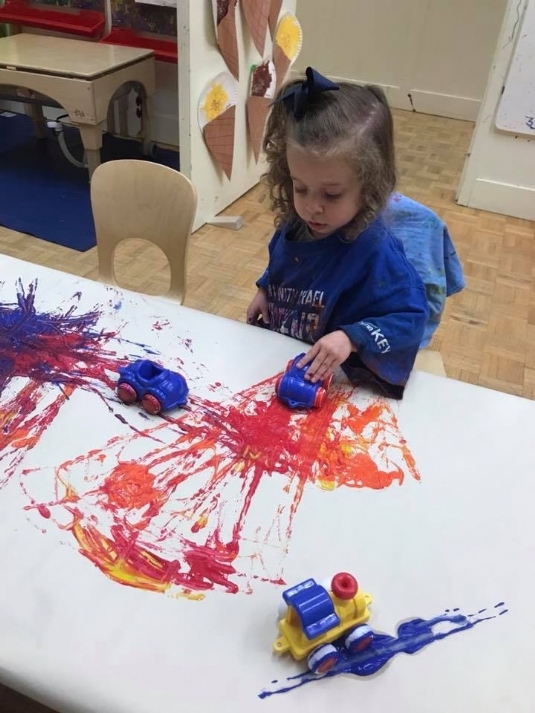 For sensory they enjoyed driving cars around in shaving cream, and playing with the toy trains, planes and cars. 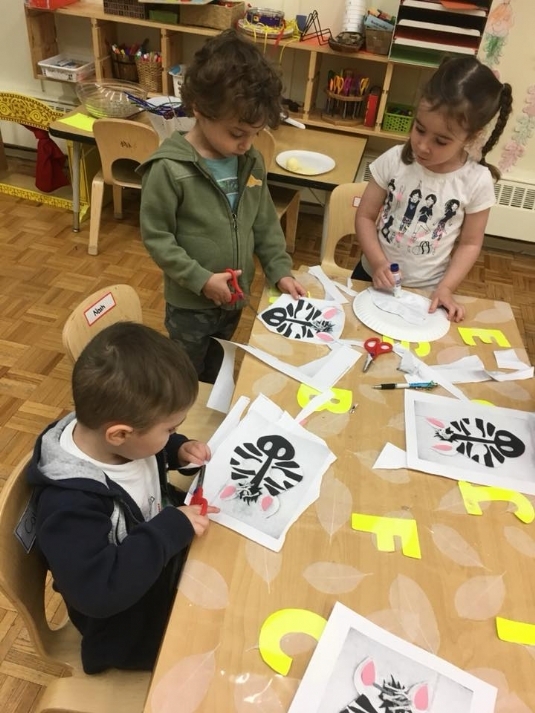 For fine motor they worked on the letter E page in their binders and enjoyed learning about elephants while making elephant masks and guessing who is behind the mask. Sensory overload in the Nitzanim class this week! We got to explore with their senses and learn about our body parts. For creative art, we all glued mouths, ears, eyes and noses to a face! We learned what our nose does, and each got a turn smelling different things - vanilla, cinnamon, vinegar, and lemon. Everyone worked together to match the right clothes to the right body part using felt pieces. Mat man came to teach us how to make the letter E. Our block centre was a giant E with excavators. For sensory, our bin was still filled with elephants and evergreen trees. 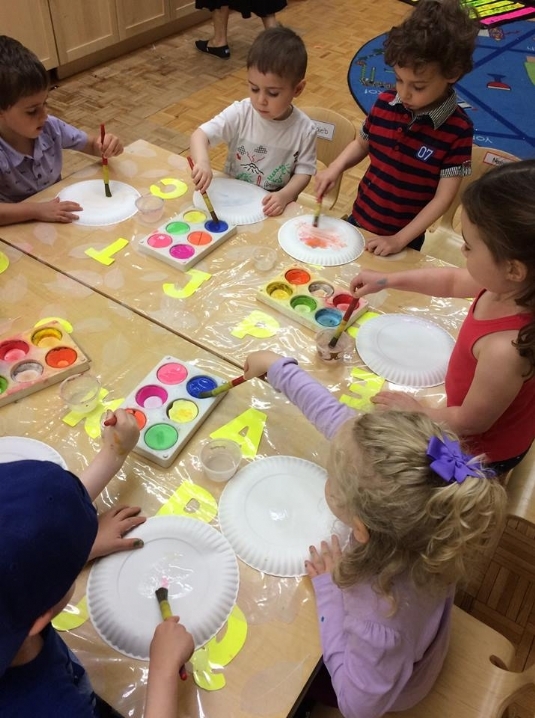 We also practiced drawing E's in salt trays and for fine gross motor, we lined up buttons in a letter E. For creative arts, some of us made paintings of eggs using balloons, and some made giant eggs using shaving cream and glue. Our water bin was even filled with glow sticks. During circle time, some of us tasted salt and sugar, and also smelled cinnamon. The Perachim class is still engaged in the fall theme and learned about the letter D. They coloured leaves which each student which they will be using for their math books. During circle they focused on words that start with the letter D - ducks, dark, daddy, donuts, and more! They also scattered toy dinosaurs throughout the sandbox and asked the students to find them for a fun sensory game. 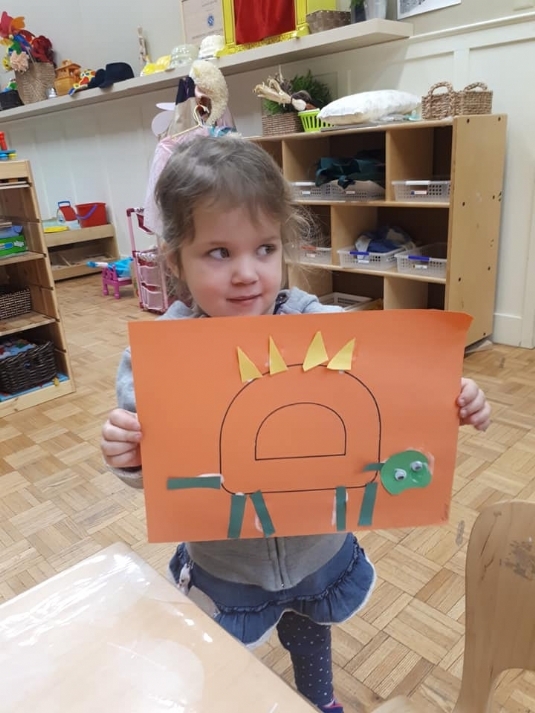 For creative arts they transformed the letter D into dinosaurs, with a tail, long neck, horns and four legs and learnt a few things about dinosaurs! Some of the students also worked on tracing letters in our workbook. They also painted and practiced using scissors for cutting. 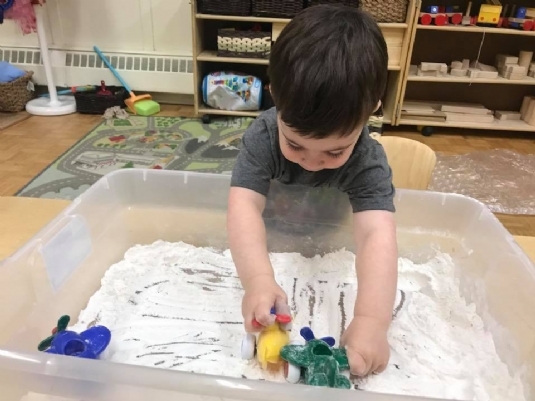 This week the Nitzanim class started learning about the letter D. For sensory, our water bin was a duck pond, and we played with dump trucks in shaving cream and sand. We worked our fine gross motor skills by balancing balls on to toilet paper rolls. 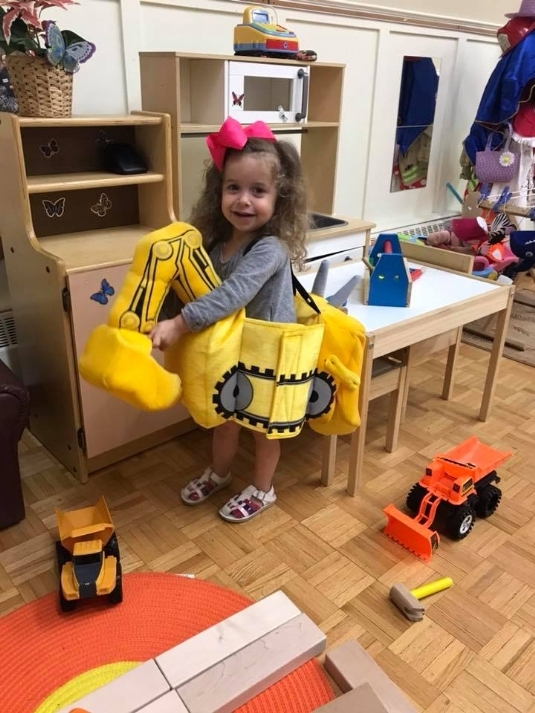 Our block center was also filled with dump trucks. 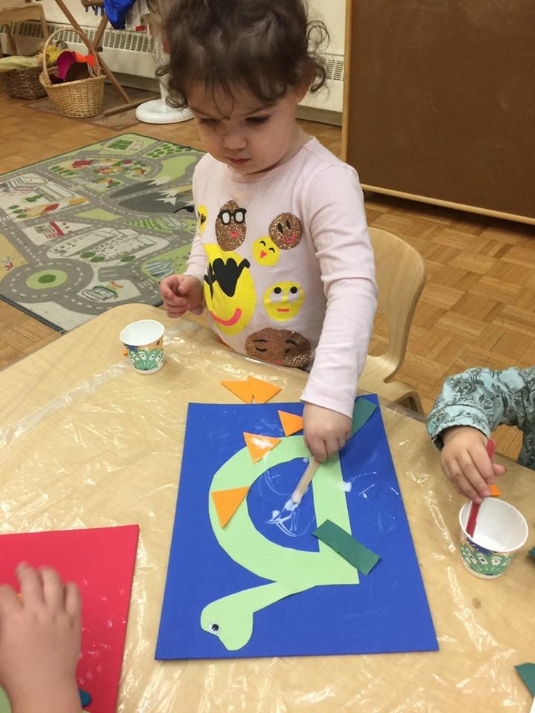 For creative art, some of us made donut paintings using pool noodles, and we all glued shapes on to our letter D dinosaur! We used our fine gross motor skills to match coloured Pom poms to the correct colour donut using tongs. 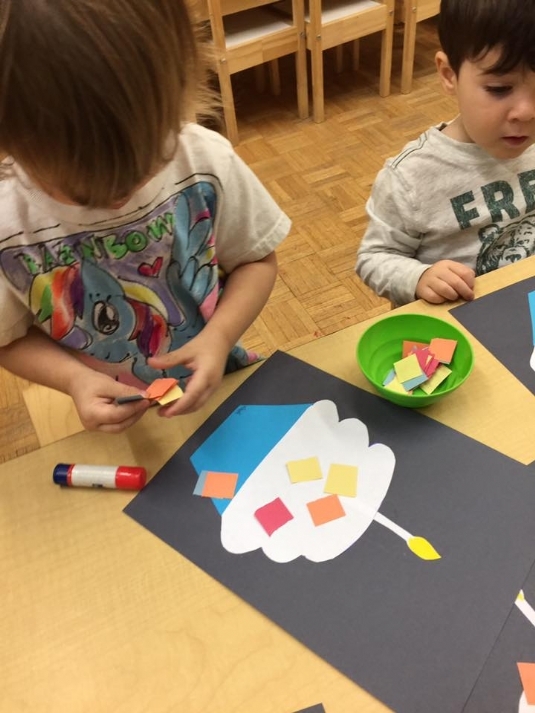 For creative art, we coloured pictures of dump trucks, and made very cute paper bag ducks. 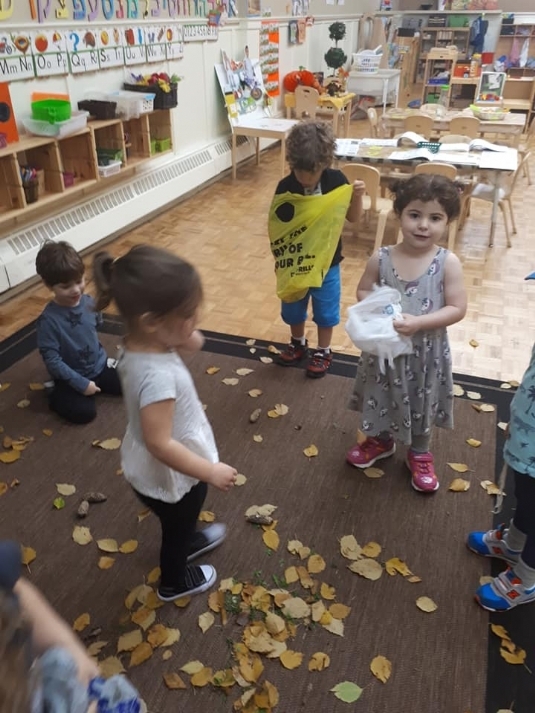 During circle time, mat man came to visit and taught us how to make the letter D.
The Perachim class continued to explore the theme of Fall and worked on the letter D. Morah Hanna led the class in an activity about counting Fall leaves. 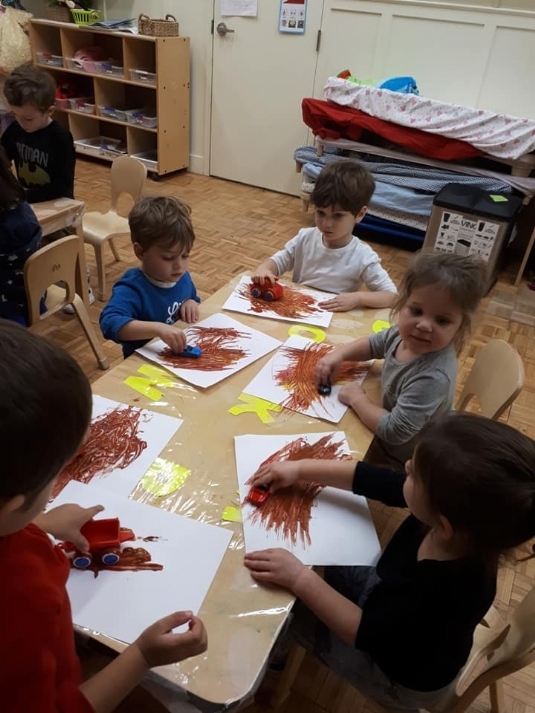 After snack, the students got to express their creativity by painting leaves and then making artwork by pressing the leaves onto paper. For math, they practiced counting up to 10 using marbles. The class got to go for a walk outside and collect our own Fall leaves. We then went back inside and played with the leaves while learning about why they fall. As a sensory activity, they observed what happens when they poured water on paper. 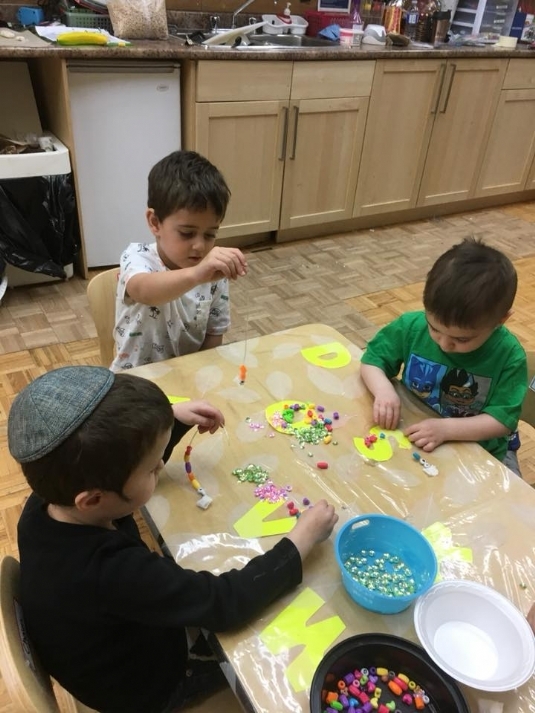 During circle they reviewed letters A B C and D, sang songs and did art including cats and caterpillar to add to the words that they know that start with the letter C.
This week the children focused their learning all around the letter C.
The Nitzanim class practiced balancing colourful pompoms on to pool noodles using tongs. Their block center was a very busy construction site. 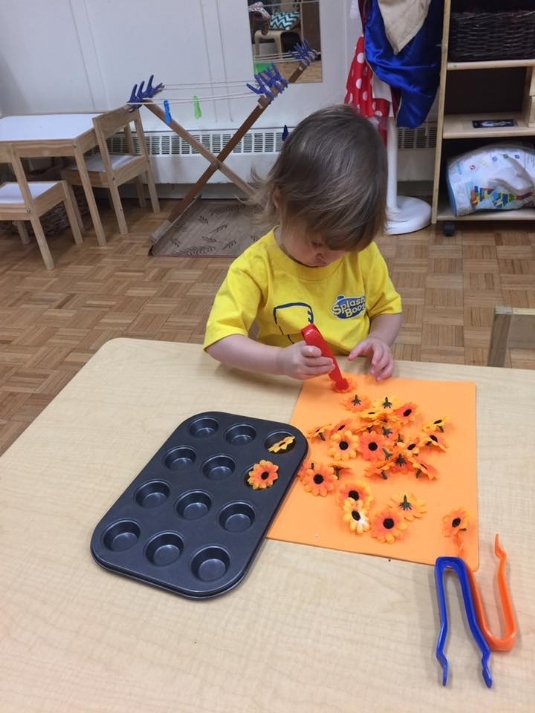 For sensory, they used their fine motor skills to cut cookies with cutters and playdough. 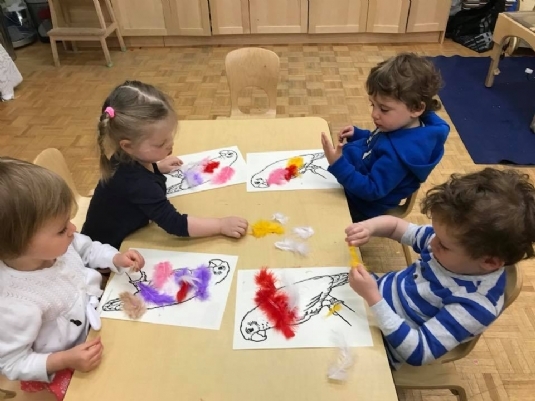 They made creative paintings using cars, and also made a big letter C caterpillar using pompoms. For circle time, mat man came and taught them what the letter C looks like, then they all took turns feeding a very hungry caterpillar. They also enjoyed decorating our cupcakes with sprinkles! 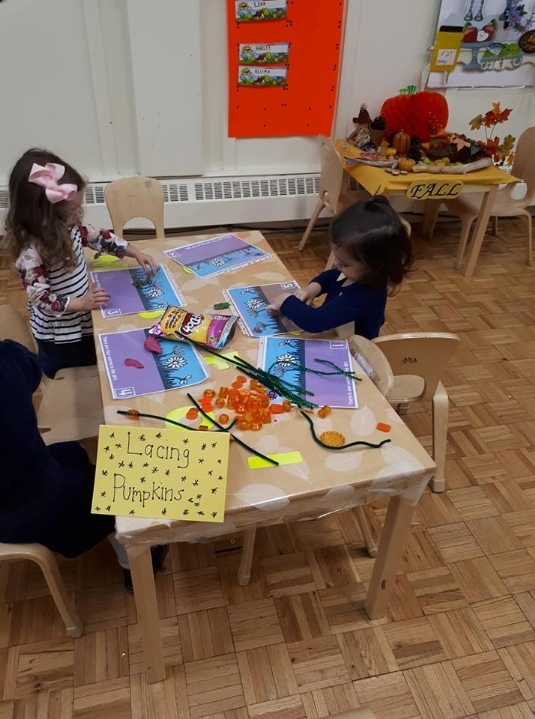 The Perachim class talked about the changes we see in fall during circle time, as well as different words that start with the letter C. They cut their own fall leaves and laced pumpkins while strengthening their fine motor skills. They also did a science experiment where they mixed colours to make fall colours. 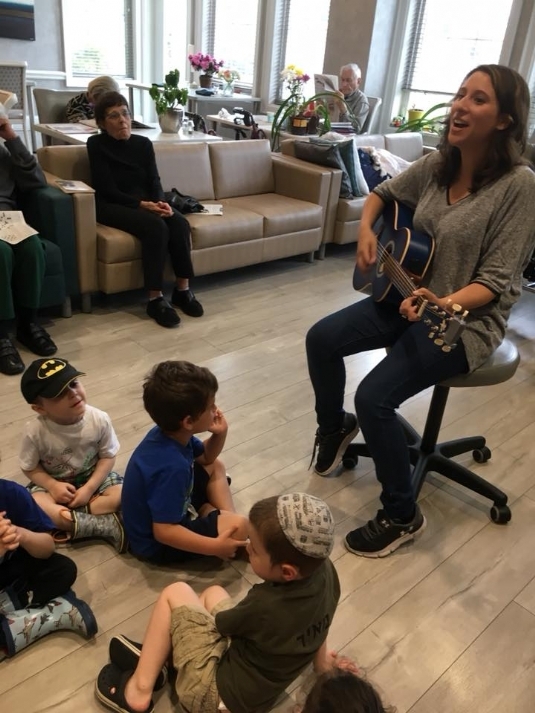 This week they enjoyed a special music class at the Senior home and helped to do a big mitzvah by visiting the people there and making music with them. It was a very special experience for all. 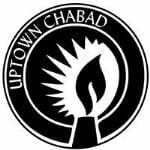 The start of the year has been a very busy and exciting time for everyone at Gan Chabad! Everyone enjoyed learning all about Rosh Hashanah, through lots of learning provocations. 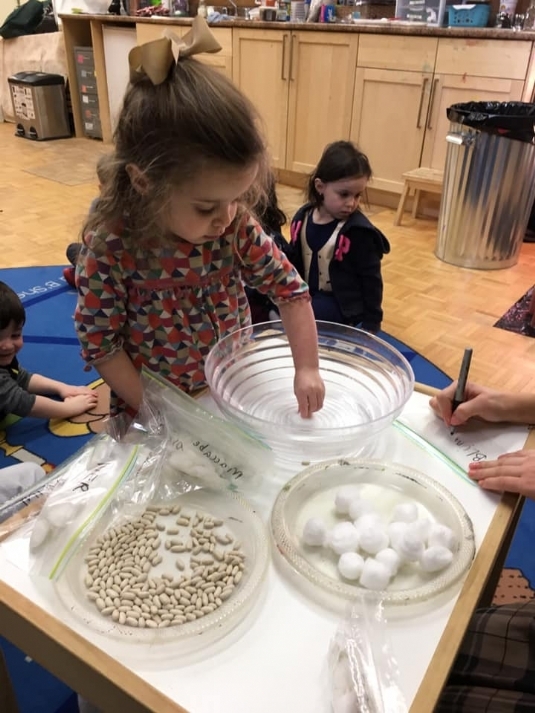 We had apple sorting and stamping for creative arts, Shofar making and listening as a neat sensory experience and honey comb paintings to help us understand where honey comes from. 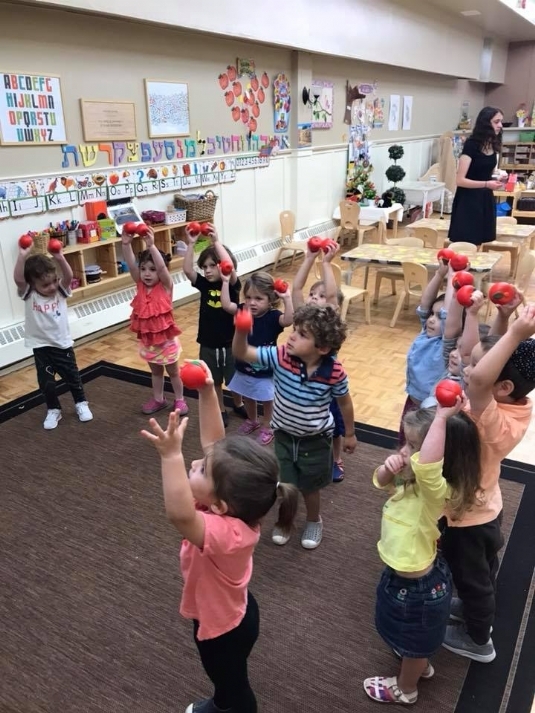 Everyone really enjoyed music with Morah Deena, she had us dancing like apple trees and moving like Bees! We also enjoyed meeting all the new friends in our classes! 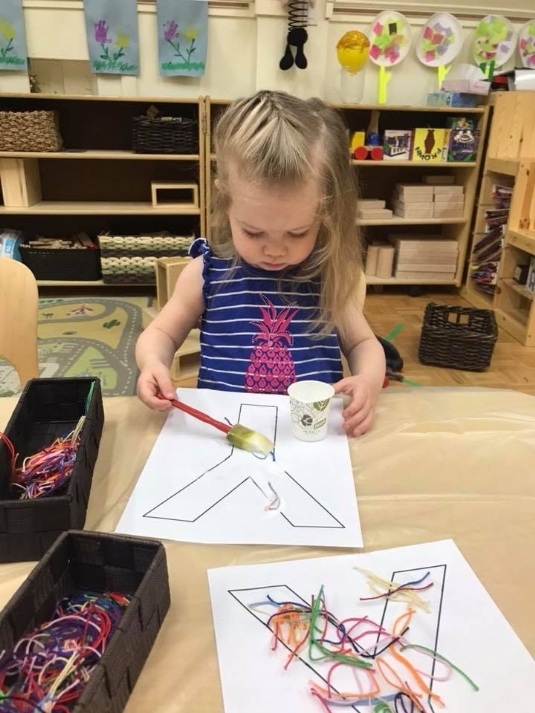 We also got started on learning all about the letter A. We welcomed mat man into our classes, and built the letter A with him. 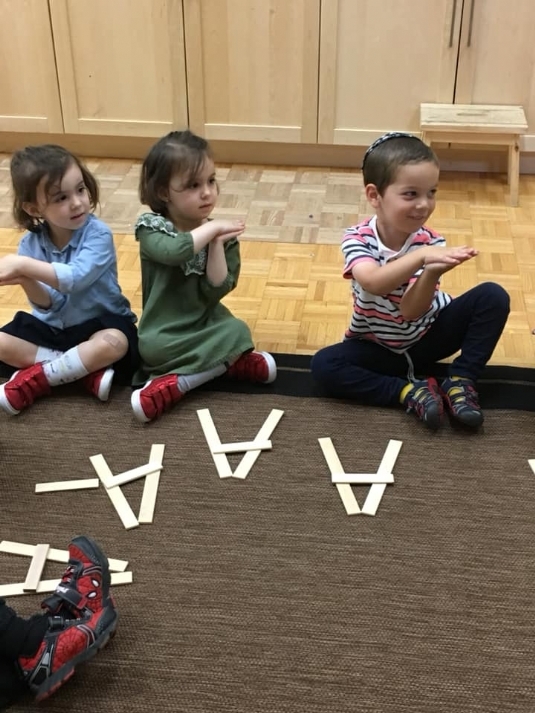 In the Nitzanim class for fine gross motor we placed popsicles sticks on the letter A. We had a blast with animals and play dough. Our sensory bin was filled with water and letters to make a big alphabet soup!! 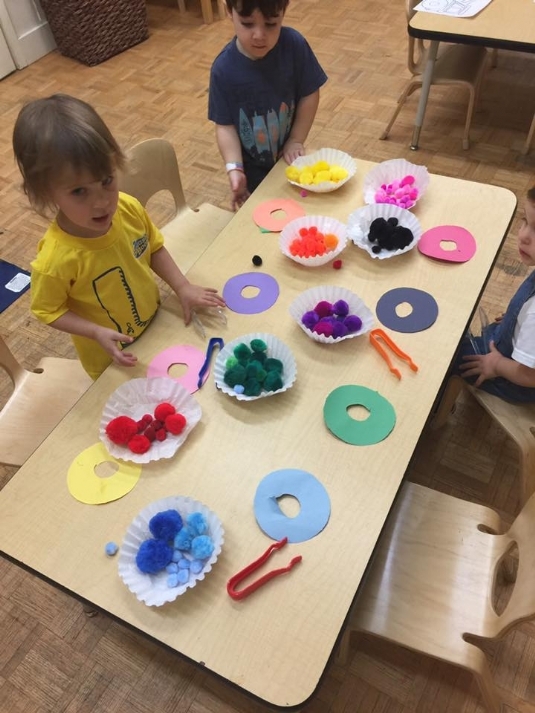 We.got very creative and glued cotton balls on to an airplane and at circle time, we flew like airplanes and chopped like alligators. We also had the coolest farm in our drama center, complete with an alligator pond! In the Perachim Class we focused on the letter A by colouring in pages of Apples and Alligators. We also read a great book all about ants during circle time. We worked our fine motor skills by writing the letter A on our own. For science they enjoyed exploring with magnets to see what is magnetic and what is not. They also used different shapes to make different patterns with. Letter review and End of the Year Graduation!!! 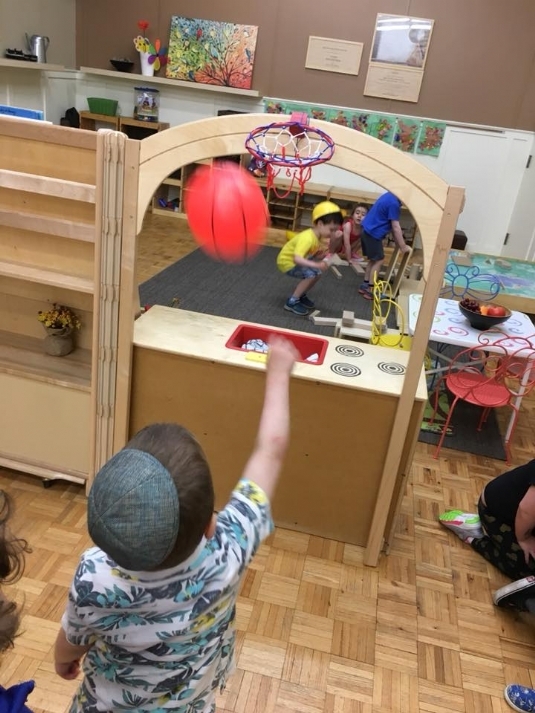 This was our final week of preschool at Gan Chabad. We spent the week reviewing and having fun with letters in all of our learning centres! 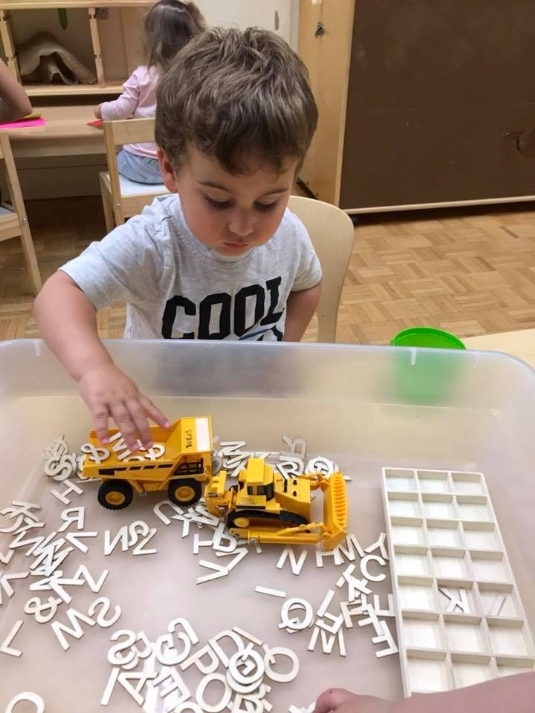 We sorted letters by colour, picked them up and dumped them around using our construction trucks. The water bin also had letters to explore with and scoop up! During circle time we sung ABC and had solo performances from those who volunteered. We also did a really cool painting where we used blue water and saw our names magically appear! We also used Play-Doh to trace and make different letters of the alphabet. We also went on a letter hunt in the pasta filled bin and stuck them to the door to see which letters we found. We decorated our letter books with stickers and enjoyed writing letters in the drama centre. We also enjoyed erasing the letters on the chalkboard with q-tips and named them as we went. 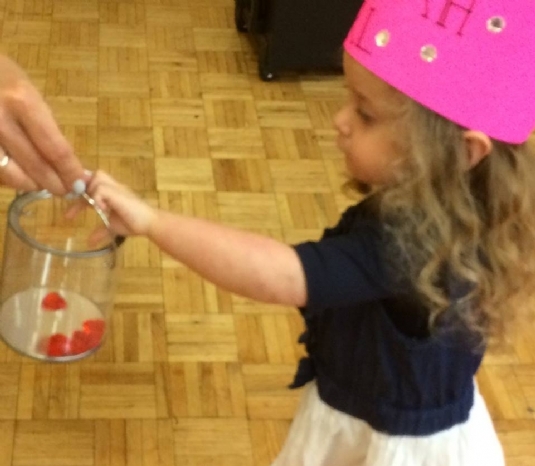 We ended off the year with a meaningful graduation celebration, themed around “filling our buckets with Mitzvahs”. 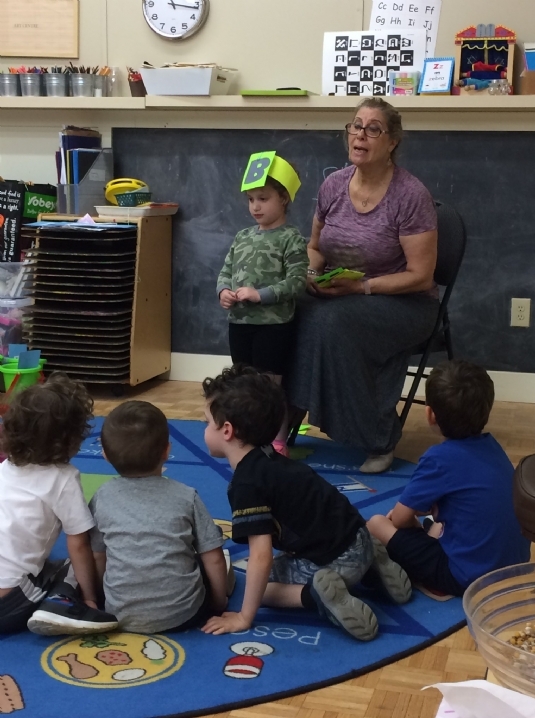 The pre-nursery class was called upon one by one to put a mitzvah gem in their class bucket as their teachers read mitzvah that they saw them do throughout the year. The Nursery class sang songs that they had been practicing and shared mitzvoth. 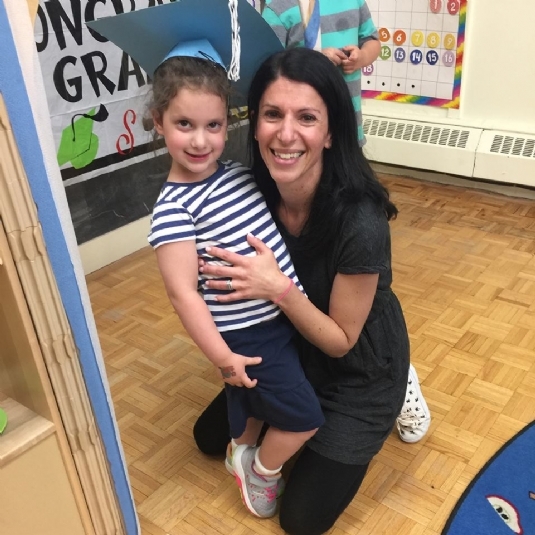 They also each got a special diploma and hat for graduating Nursery school. We will miss those that are moving on to JK and wish them all the best and encourage them to continue thinking with their hearts, and filling other people’s buckets by doing mitzvahs. This week is all about transportation. Each day we focused on a different mode of transportation. First it was cars and trucks. 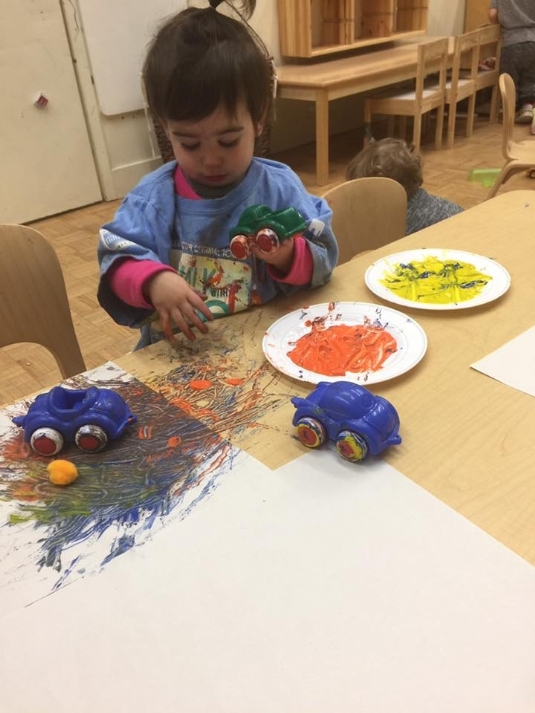 We got messy and drove our cars through paint to see their tracks. We also used fine motor skills to make our own tissue paper cars. At the block centre we made a car garage and also used ramps to experiment with the cars. The drama centre was an auto repair shop and we used tools to help us fix broken cars. Next it was all about airplanes! In the sensory bin we had the airplanes flying through flour. We also painted tubes to create our own planes. For dramatic play we took turns going inside of our very own airplane and enjoyed when our friends helped to push us around the room. We read a great book called Angela’s airplane and had fun flying all around our room! Another way to travel in the sky was hot air balloons. 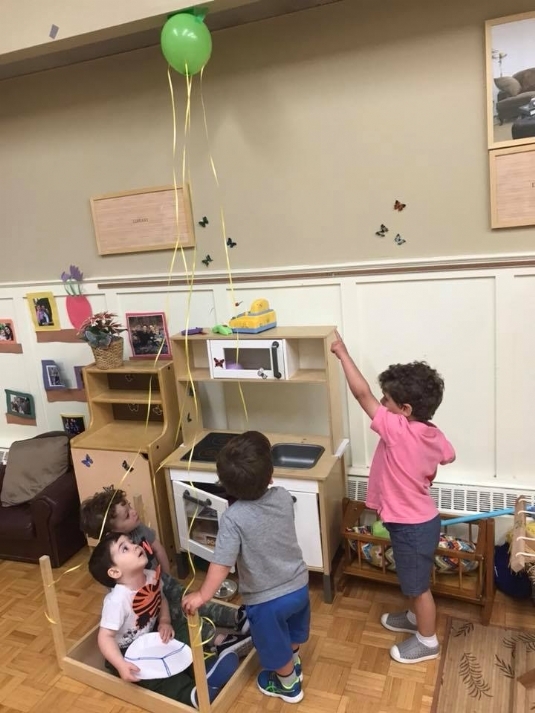 We had balloons all over the class. We used them to paint with. Used them in the block area and enjoyed throwing them up in the air and to our friends. We also used bingo Dabbers to make our own hot air balloons. 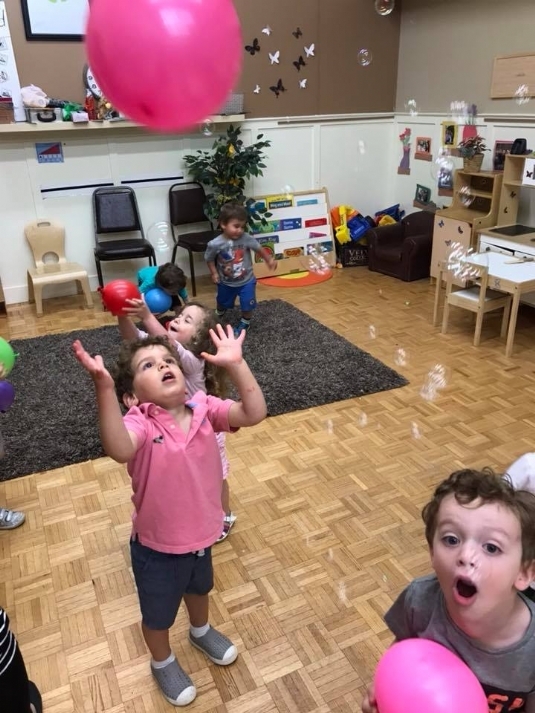 During circle we helped a hot air balloon fly around by passing it to our friends and we also played a freeze dance games and tried to keep them up in the air. We did a really fun science experiment with baking soda and vinegar and loved seeing all the bubbles! Lastly it was all about boats. 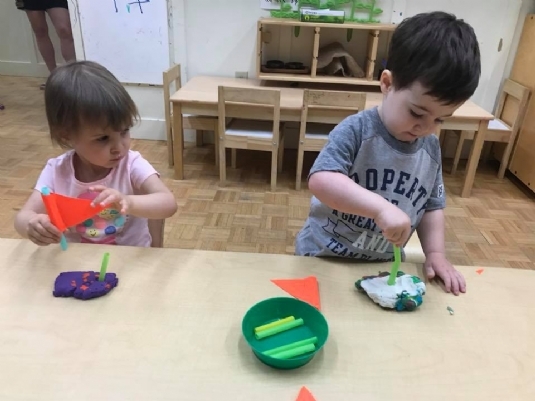 We made boats using Play-Doh and painted our own sailboats with water colour paints. We also enjoyed the sensory bin that was filled with blue shaving cream and boats! We read a book about transportation and sang row row row your boat with our friends. We even experimented to see if boats sink or float and how we can get them to move (with our hands and by blowing with our mouths). This week we have been very busy learning about different sports. We focused on soccer and made a paper mache soccer ball of our own for creative arts. We also practiced our gross motor skills by playing soccer in our class. In the Block Center we built our own arena and had little people playing soccer with little balls. Then we focused on hockey. To work on fine motor skills we cut our own pucks and made our very own hockey sticks! We also talked about the difference between hard and soft balls, and reviewed different kinds of sports that use them. We focused on the shape of a football and made our own handprint touchdown signs for creative arts. We also focused on the sport of fishing and made our own little lakes filled with fish so that we could practice! We also had a very meaningful visit to the old age home to have a combined music class together. This week we learned about different community helpers and how they help us in the community. We started off with construction workers! 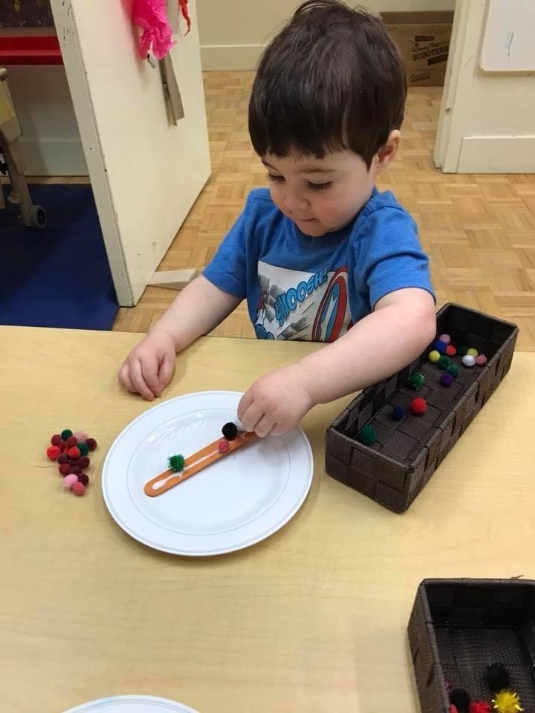 We were very busy creating sculptures at the Play-Doh table and building in the block center. We also used rocks to build different letters with. 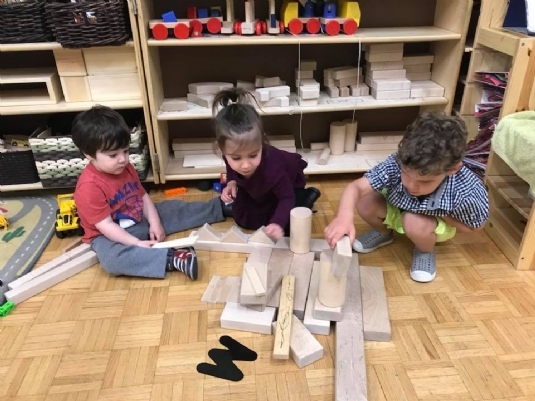 We used popsicle sticks and bricks to help make our own blue prints and then constructed our plans with connecting blocks to make our creations come alive! 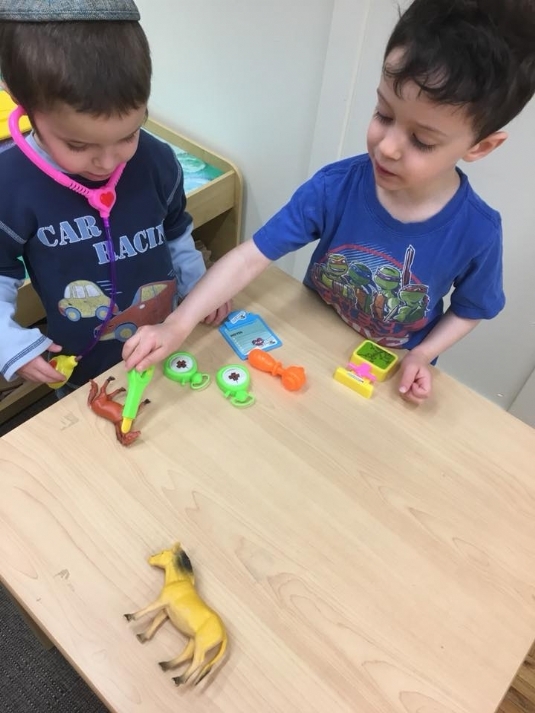 To learn about the job of a vet, we took notes with our letters on magnetic trays and the drama centre was a vet office full of pets and doctor tools. For circle, we read a book about a vet and then got to help a parrot by gluing him lots of new feathers! Lastly, we learned about police officers and tried to solve a mystery in our drama center. 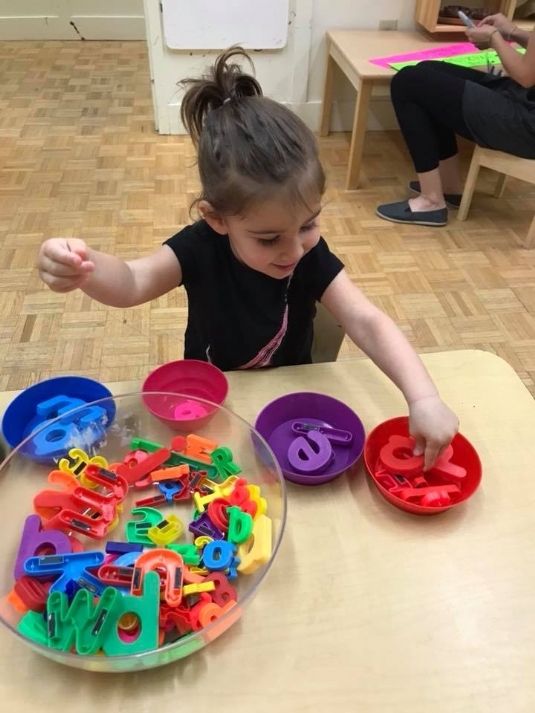 We looked for clues and letters in the sensory bin and collected them with magnets. We also made and baked our own police cars! We all enjoyed music, especially the parachute. For circle, we read a book about police officers. Played a gross motor game of red light green light and then made stop lights of our own for creative arts! This week was all about different kinds of transportation! 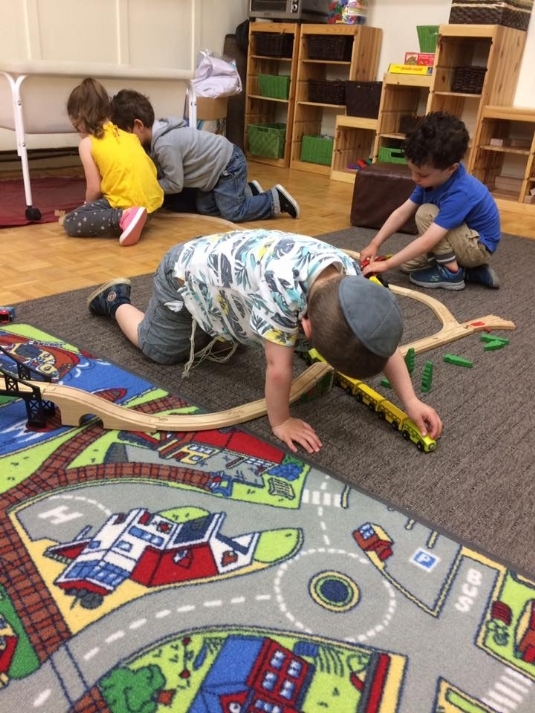 We built a long train track in the drama center and enjoyed playing with the trains. For creative arts, we used water colours to paint pictures of trains. During circle time we talked about different kinds of transportation and sang songs about cars and trains. Our drama center was a parking lot where we drove cars on our road mat, and matched numbered cars to numbered parking spaces. 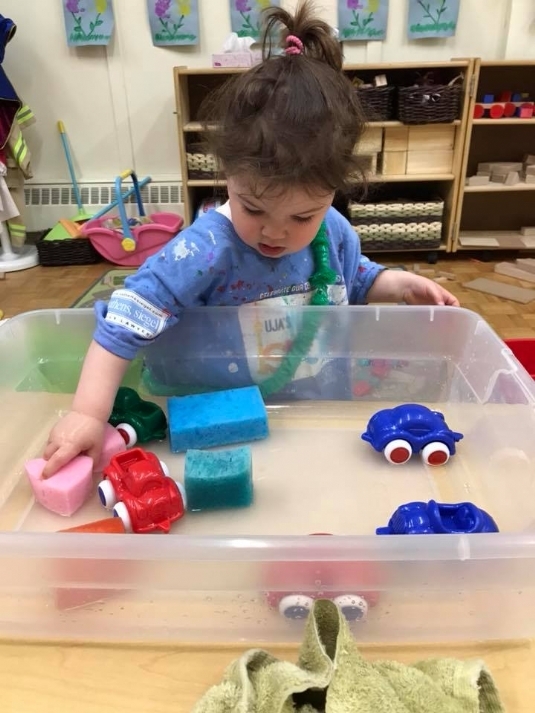 Sensory was driving cars through "mud" (mixed beans). 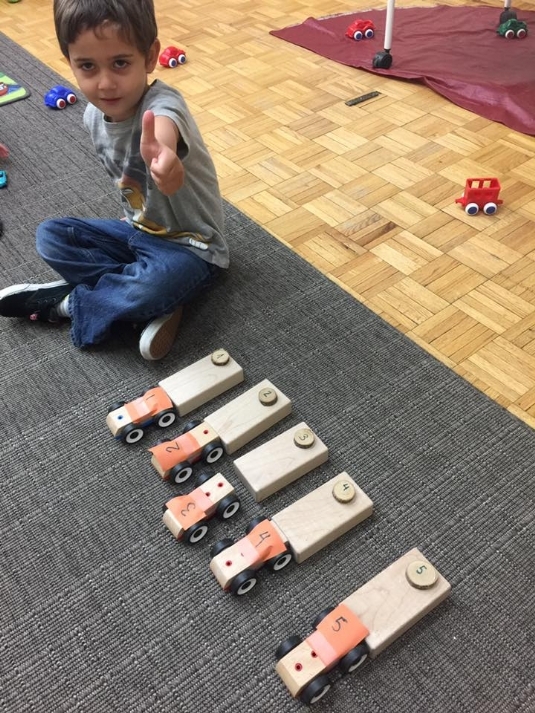 We used our fine gross motor skills by cutting out wheels and glueing them on to cars. For circle time we read a story all about construction vehicles, and then played a game of guess which truck is in the middle. For creative art, we made airplanes using popsicle sticks and cotton balls. 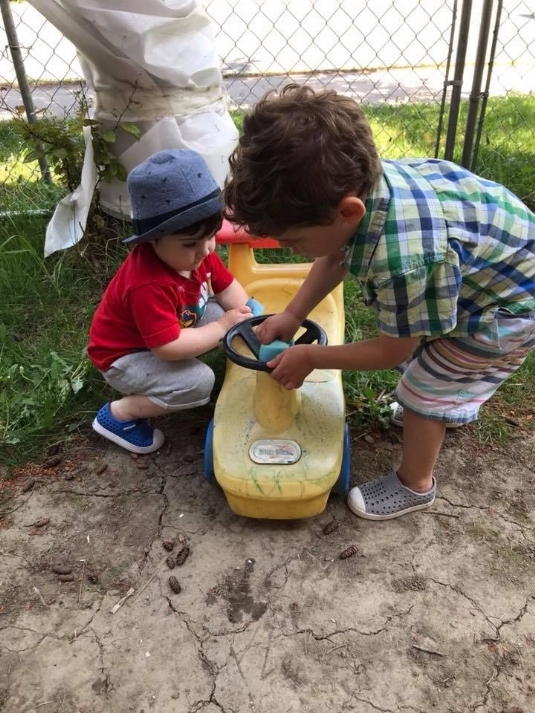 We also made a chart by writing our names under our favourite vehicle and then had turns acting like a vehicle so our friends could guess what we were! Summer fun has filled our classroom!! We practiced fine motor skills with chalk drawings and also glued tissue paper to make our own ☀️’s! 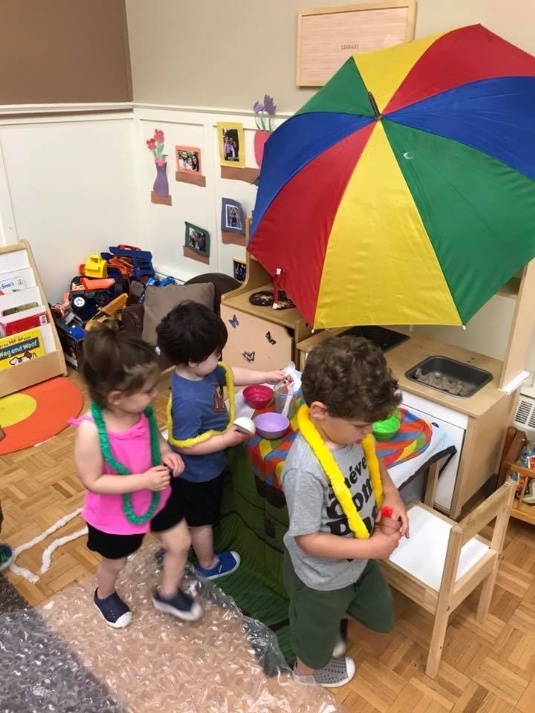 The drama centre was summer ready with towels, an umbrella and lots of ice cream for everyone!! We went outside and enjoyed the beautiful summer-like weather and then had circle time and discussed the different clothes we wear in the summer as well as sung some songs with our ☀️‘s. We made fans to help us stay cool, and explored in the water table with our handmade boats. Outside we had fun painting the walls and house with water and then cooled down by making our own lemonade and tasting it! We chose flavours for our ice cream craft and painted them and then added sprinkles! We also coloured on car in our class and then gave them a car wash! Sensory bin had shells and boats for exploration and splashing fun! We all enjoyed music with Sylvia and loved the parachute! We continued the car wash fun outside and got our cars looking squeaky clean! We also explored and sorted different types of shells and also made awesome sun catchers for creative arts. We focused on Summer this week and started with fun under the sea! We painted pictures of sea creatures for a creative arts activity. During circle time, we talked about different animals that live underwater. We also practiced our fine motor skills by lacing strings through animals. We practiced counting when we counted marbles to put in cups. For creative arts, we used bingo dabbers to decorate buckets. We worked on our fine motor skills by peeling stickers and using them to decorate shovels. We also used water colour paints to paint a picture of the ocean. We also enjoyed singing, dancing, and playing instruments in our music class! During circle time, we reviewed the alphabet by playing a game! We had to guess what letter was on our head by listening to the sound the letter makes. At the end of the morning we played outside and used sponges to clean the playhouse. We even made an ice cream cone craft! We used our fine motor skills to decorate our cones with stickers. Then we crumbled tissue paper for ice cream scoops. We made a pretend pool in our drama centre and had fun playing together. 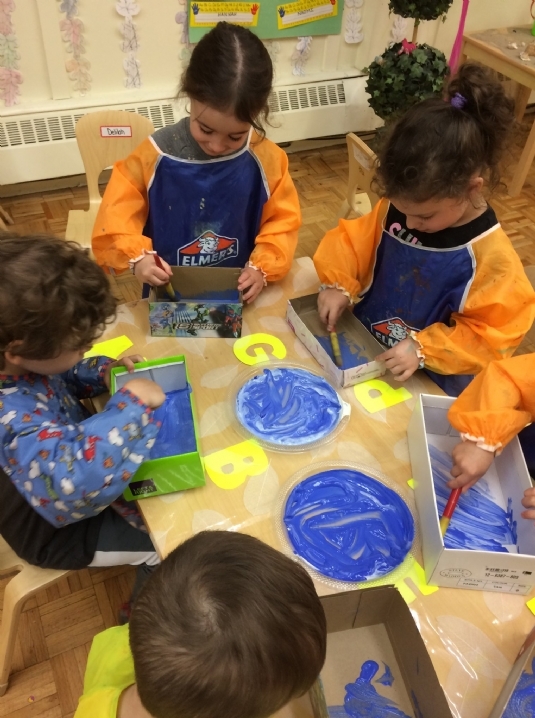 For creative arts we painted our boxes blue. Next week we will use them to make aquariums! We also made yummy lemonade! We used our muscles to squeeze the hard lemons! This week we learned about our final letter of the alphabet!!!! Z! Our sensory bin was filled with rice and zoo animals, and our playdough table was filled with zoo animals as well. 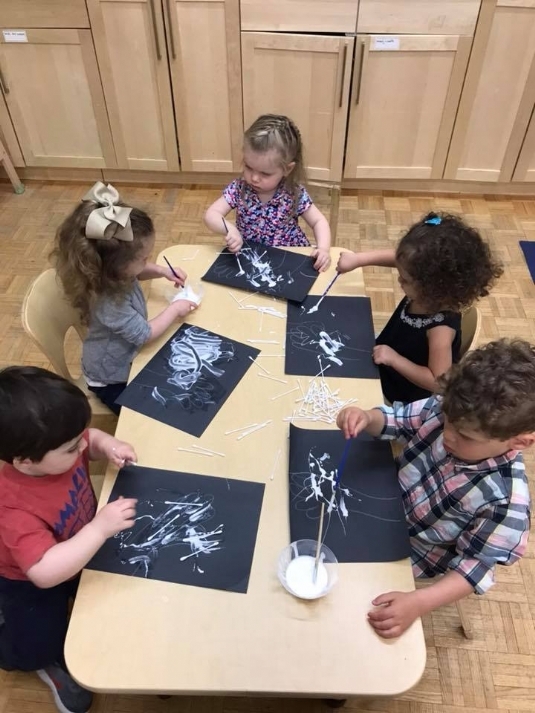 We also practiced drawing the letter z in shaving cream. Our block centre was transformed in to a letter Z race track! 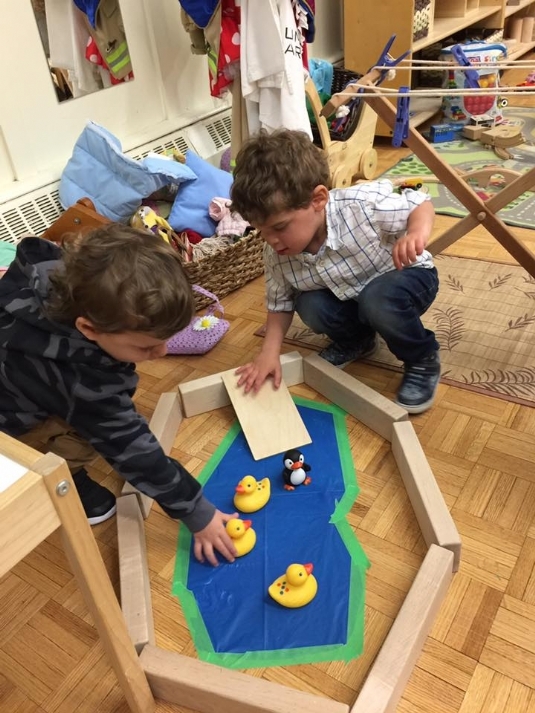 We officially opened up our GC Zoo in our dramatic centre, complete with a duck pond! We stamped zeros at the creative station and practiced our cognitive counting with zoo animals. The sensory bin was filled with rice, animals and supplies to make zoo enclosures with. We also built mat man and he showed us the letter Z and we found a Zipper on one of our friends and practiced zipping it up and down! 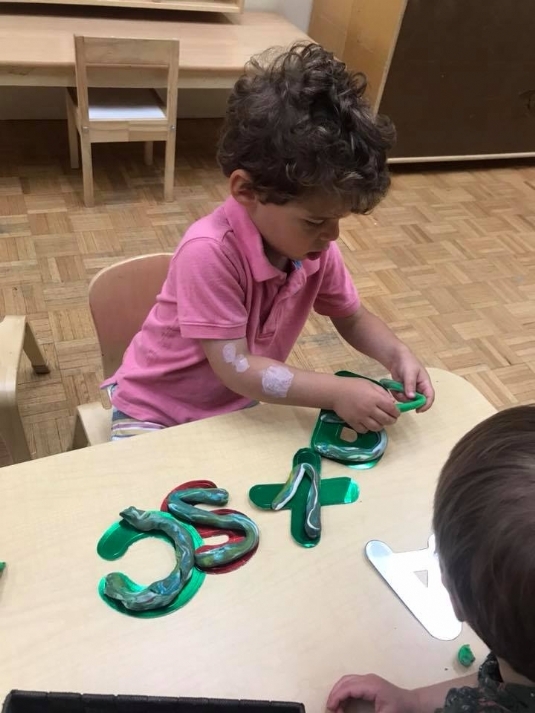 We worked on our letters by glueing stripes to our letter Z’s. We also got to get messy and finger pint stripes onto zebras! During circle we read a book about the zoo, counted baby animals and played a fun game where we got to do the actions and sounds of so many different animals. We learned about the last letter of the alphabet, Z!!! For creative arts, we made zebra masks. We practiced our cutting and cut paper stripes for zebras. 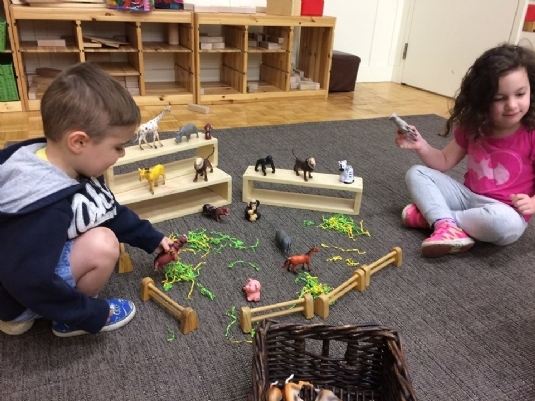 We opened a pretend zoo in our classroom and enjoyed playing with the animals. 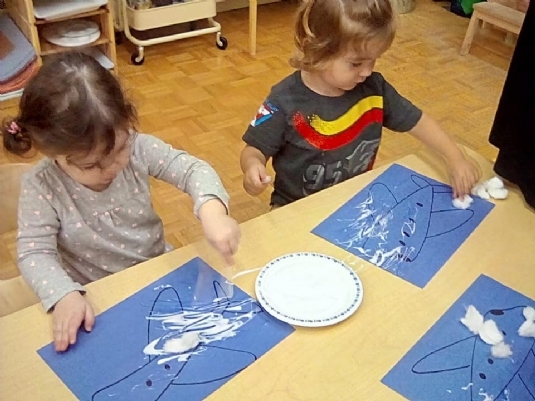 We had lots of fun writing the letter Z in shaving cream for a sensory activity. We also practiced writing Z in our work books. For creative arts, we made stripy black and white paintings with marbles. We also had fun driving in our pretend car to the zoo in our classroom. We also practiced our cutting skills by cutting out zig zags. At the end of the week we enjoyed showing and sharing our Z toys and playing outside. 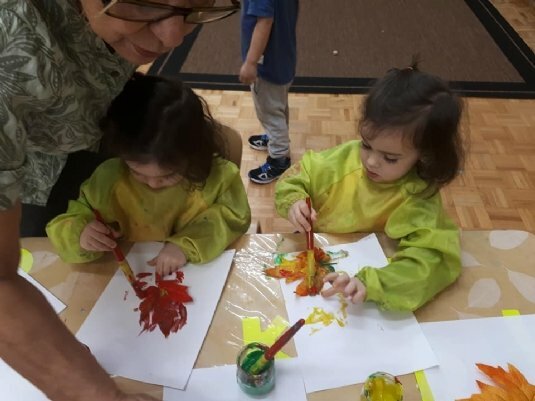 This week we focused on the upcoming holiday of Shavout and the letter Y. Monday was a Yellow day! 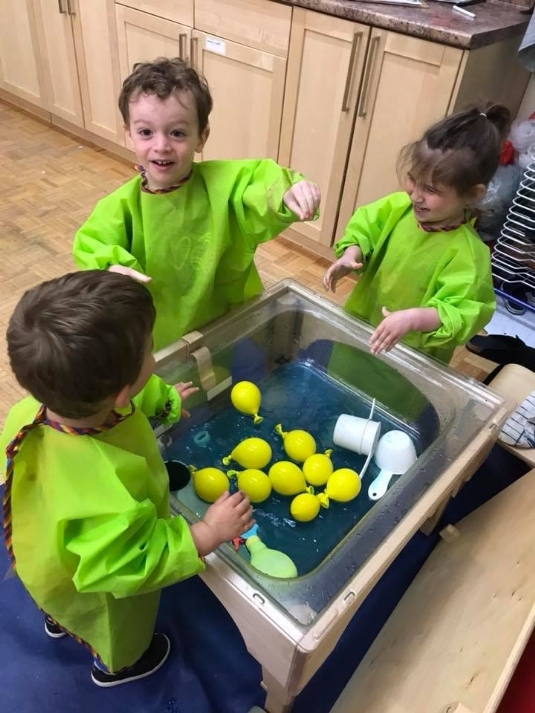 The sensory bin had yellow water and yellow water balloons which everyone enjoyed squeezing, splashing and bouncing. We worked on building different coloured towers with our blocks. We also worked on fine motor skills by picking up flower petals with tongs. For circle time we went on a yellow hunt for yellow objects around our room and counted how many we found. We also played a memory game with some of the yellow items. 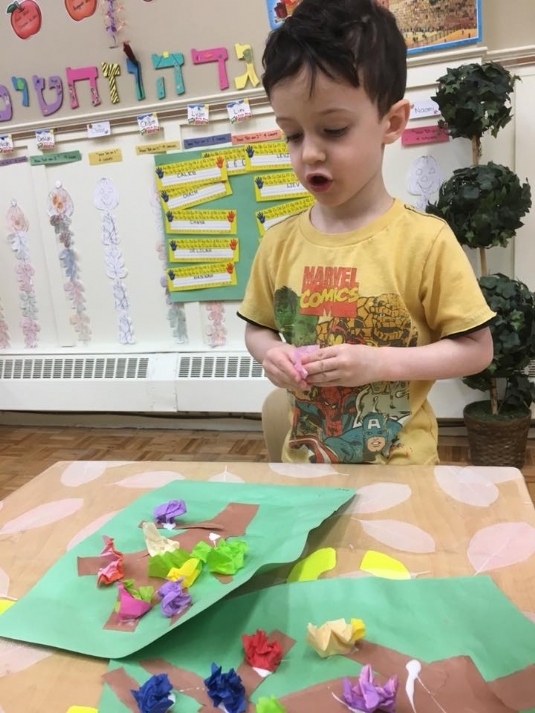 We got ready for the upcoming holiday by planting flowers in Play-Doh. We worked on fine motor skills by colouring and peeling flower stickers to make beautiful crowns! 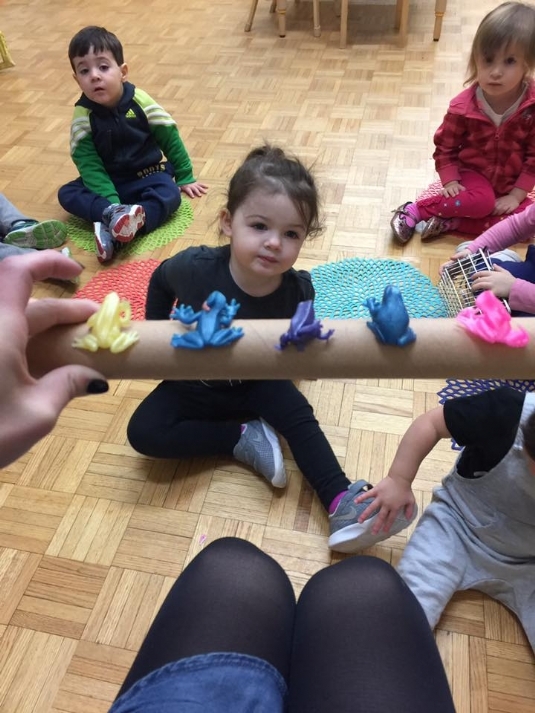 During circle a couple of volunteers helped to tell the story about how Har Sinai was given the Torah and then we danced and celebrated with our mini Torah’s. For creative arts we made our own Har Sinai and decorated flowers for it. We also did lots of Y inspired activities. We tried to weave yarn through the holes in our baskets. 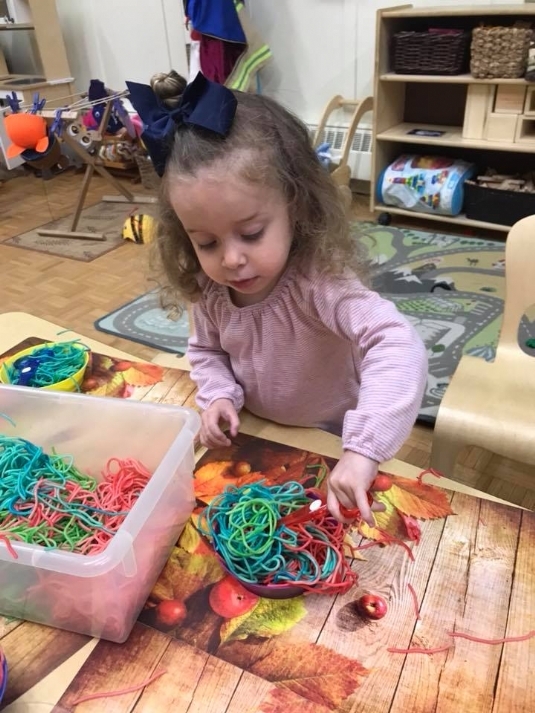 We worked on fine motor skills by cutting spaghetti yarn with scissors and knives. A couple of us got messy and helped to make a Yellow yarn bowl. We also glued different coloured yarn to our letter Y’s! 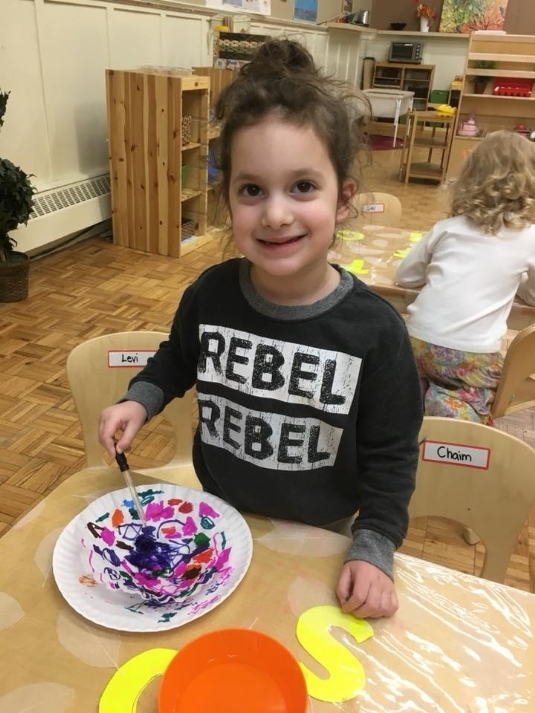 We had lots of fun painting pictures with yellow puffy paint. During circle time, we talked about different words that start with Y. We also used our bodies to make a Y! 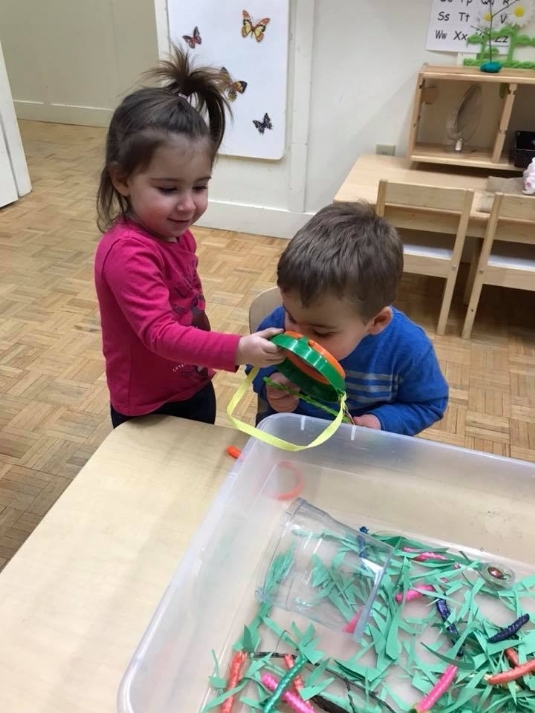 We practiced our fine motor skills by threading pipe cleaners through a strainer and enjoyed playing with rice and corn kernels for a sensory activity. For creative arts, we made yellow paintings with yarn and made construction paper yaks. 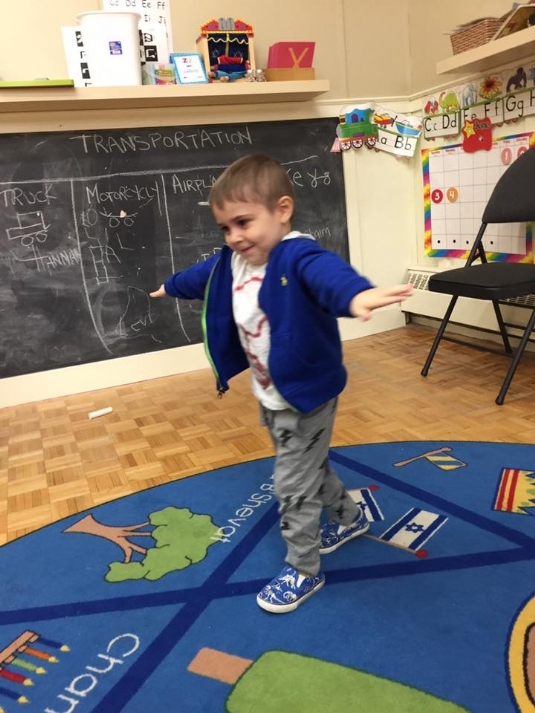 At circle time, we made Ys with blocks and with our bodies! We also practiced writing the letter Y and painted yellow yo-yos. 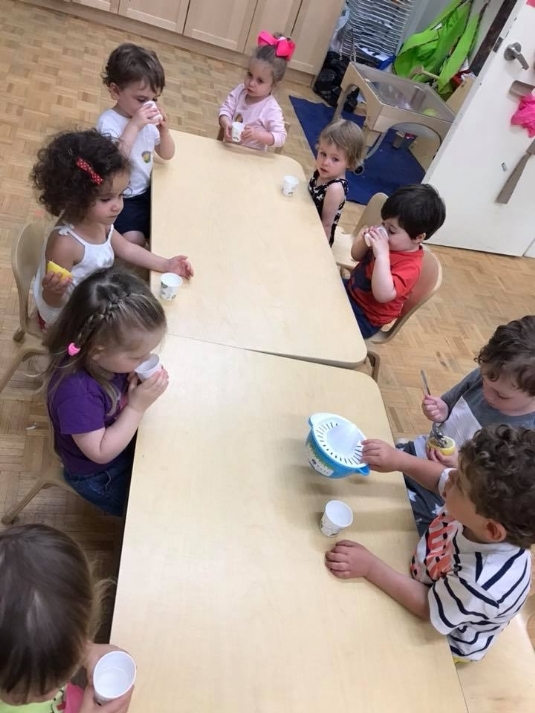 We were busy getting ready for Shavuot! We read a story about Sammy Spider celebrating Shavuot. We added tissue paper flowers to our Har Sinais. 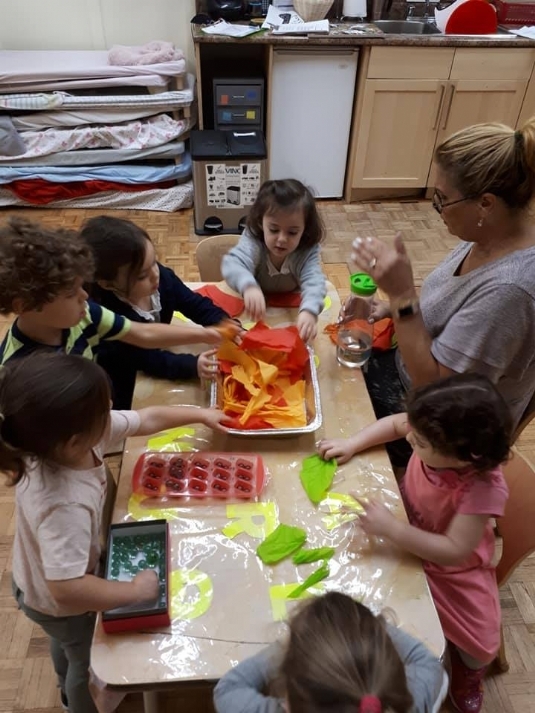 We had fun playing with slime for a sensory activity. 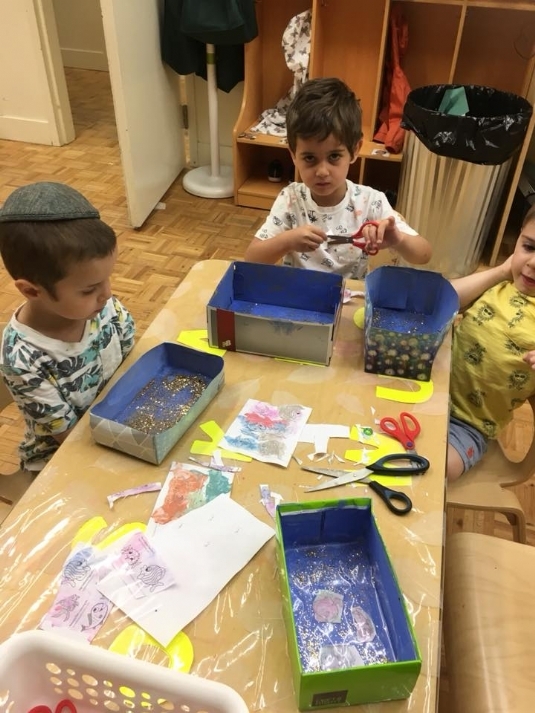 For creative arts, we decorated Shavuot crowns and painted paper baskets. We decorated our ten commandments crafts and Shavuot baskets. 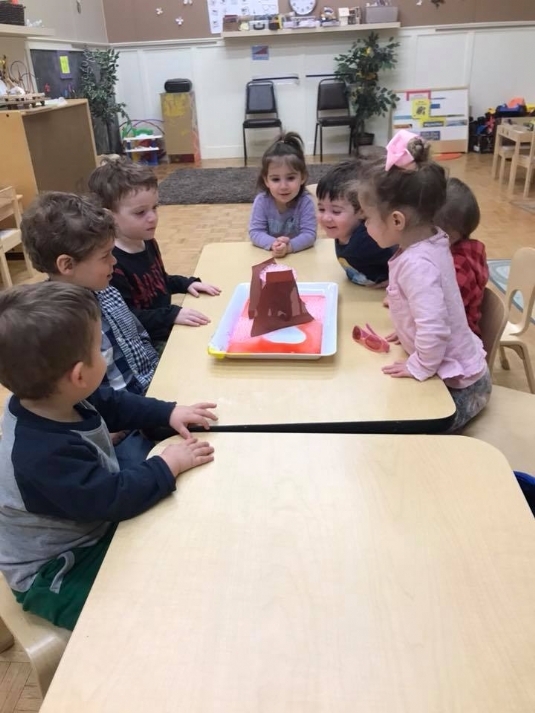 For dramaticplay we took turns pretending to be Har Sinai and talked about how Har Sinai was given the Torah. 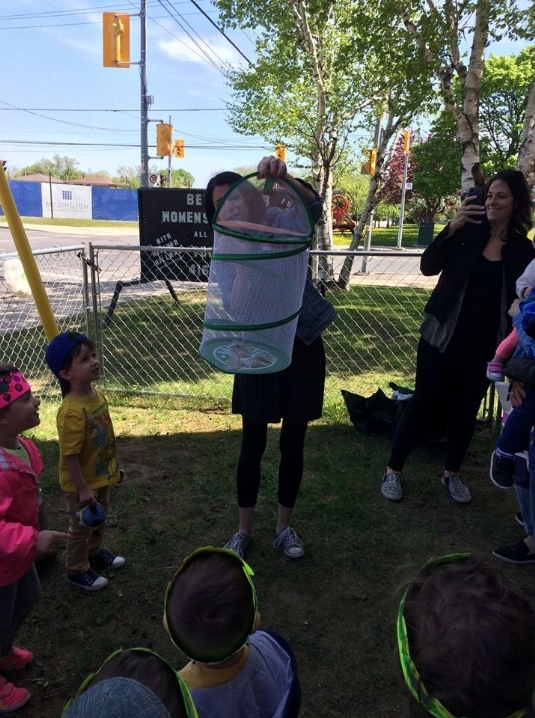 Both classes also released our butterflies! It was so exciting to see them change from caterpillar’s to butterflies and then to watch them fly away! 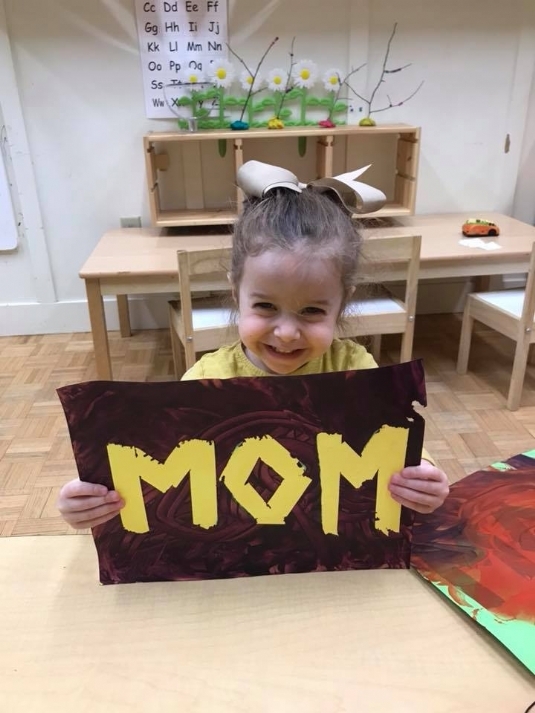 This week we focused on all the wonderful things about our moms and also about the letter X. 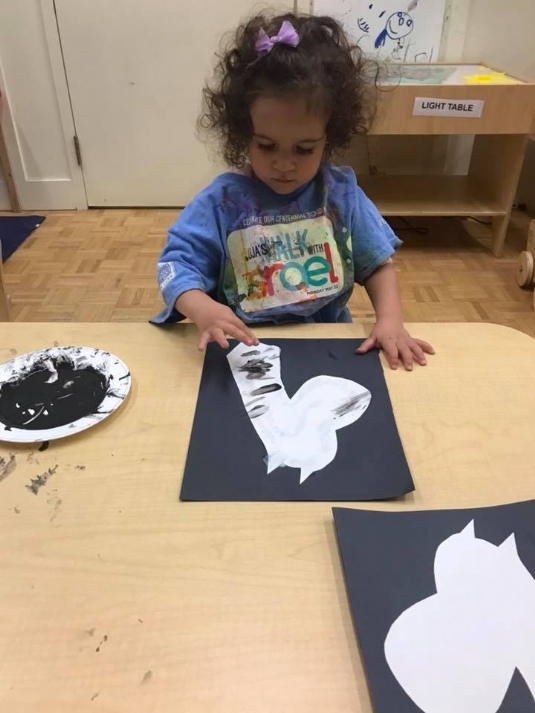 We made heart stamps using cardboard tubes and paints. We decorated our secret surprise with stickers and worked on our fine motor skills. We helped to give animals a nice soapy bath in the water bin. Made flower bouquets, and did a little bit of finger printing. During circle we read a book about giving mom 5 min of peace (and hopefully quiet) and also did an experiment and listened to the different sounds water could make. 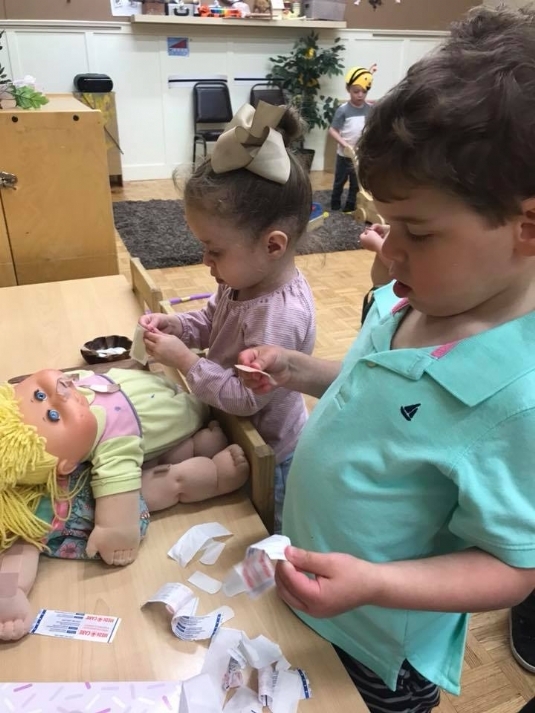 We cared for our baby dolls by peeling bandaids and sticking them on to help them feel better. We learned about the letter X and made X’s with sticks and also got to play an xylophone which we all really enjoyed! We also used our X-ray machine to see different bones. 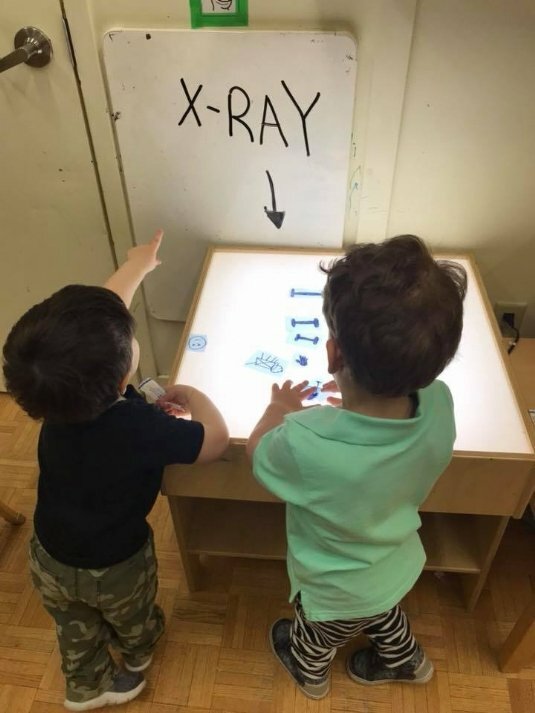 We made our own x-ray drawings with chalk and black paper, while some of us worked on our letter X xylophones. We also read a book during circle about Maisy having to get an x-ray at the hospital and then made our own x-ray handprints and Play-Doh x-ray prints with q-tip bones! This week we worked on making something very special for Mother’s Day. For fine gross motor we practiced lacing holes in different animals. We also opened up our flower shop and learned how to buy and sell. 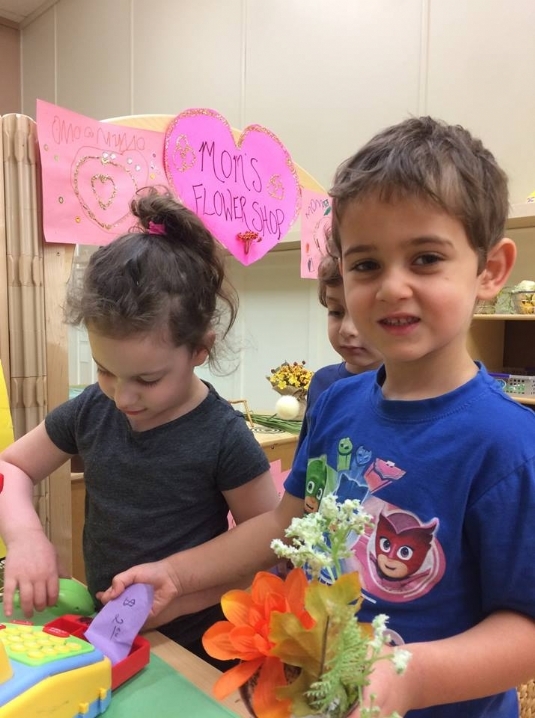 We had such a fun time outside, and we had fun getting ready for Mother's Day and Shavuot!! 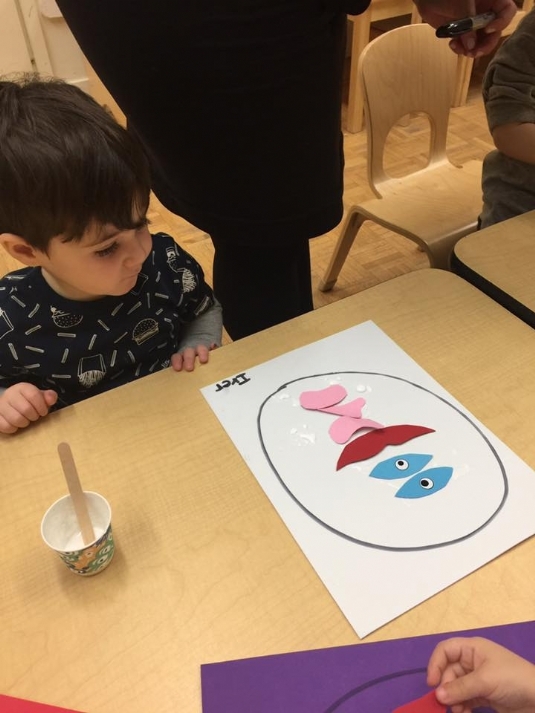 We painted our own Har Sinais and helped make a secret treat for our Mommys! During circle time, we learned about the holiday of Shavuot, and read a story about moms. This week we were learning all about caterpillars and butterflies! 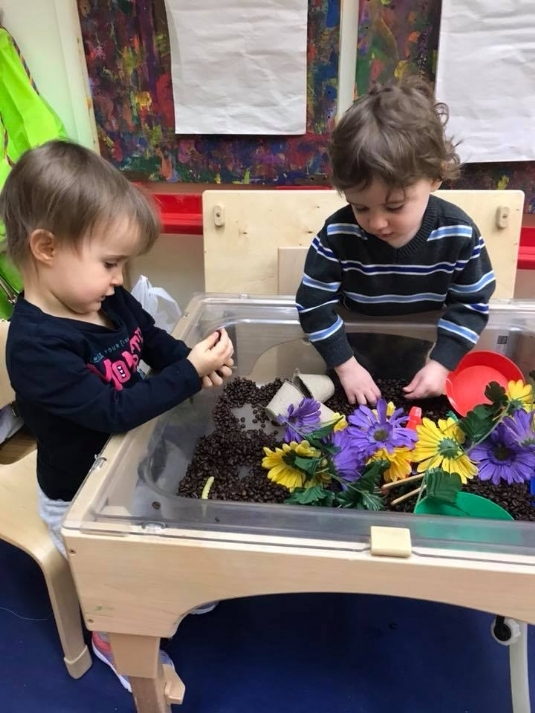 We explored in the sensory bin filled with caterpillars, twigs and grass and used fine motor skills to pick them up and examine them more in bug containers. We also made our own caterpillars by glueing Pom Poms onto popsicle sticks. Our drama centre was a butterfly garden which is very enchanting. We made butterflies by filling bags with loose parts to help make their wings look beautiful. We worked on creating caterpillars by lining up circles and matching them by colour. We also worked on fine motor skills by making caterpillars with Cheerios. We saw how “magic” happens with our symmetrical butterfly paintings. During circle time we learned about the letter V, and talked about volcanos and then did a science experiment to see how they erupt. This week was all about the letter “V”. We converted our drama center into a vet clinic. Coach Cory came and got us moving! For are we did a letter search and did bingo dabbing on the letter v. we were all very busy being vets. We worked with Velcro to help us with fine motor skills. For art we painted with vegetables. We did a science experiment and made our own volcano. We practiced writing the letter V in our writing without tears books. For art we glued pictures of vegetables on paper. we made 3D paintings with vehicles, and painted the planet Venus. Spring has sprung, in our classroom at least. We worked on fine motor skills by beading tree buds into real branches. We also used water colour paint to give colour to some pretty flowers. The drama centre was a spring garden, where we were planting and taking care of our plants and flowers. 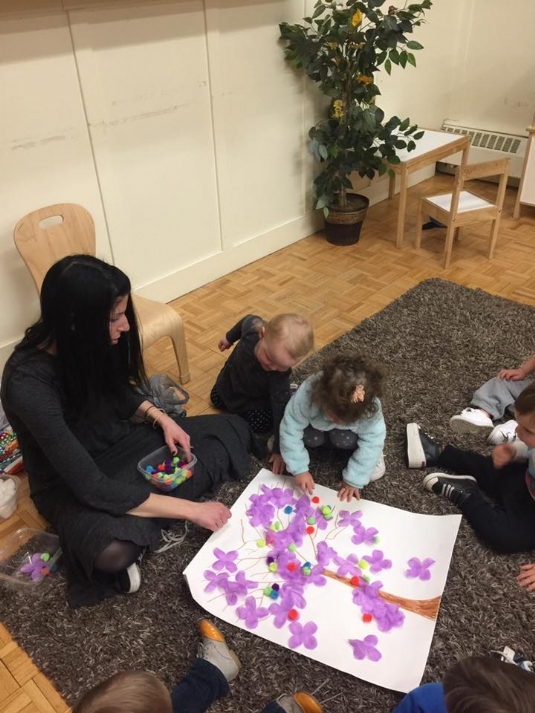 In the block centre we built trees and added large buttons as flowers. During circle we talked about the changes we see on the trees during the spring and named the different parts of the tree. 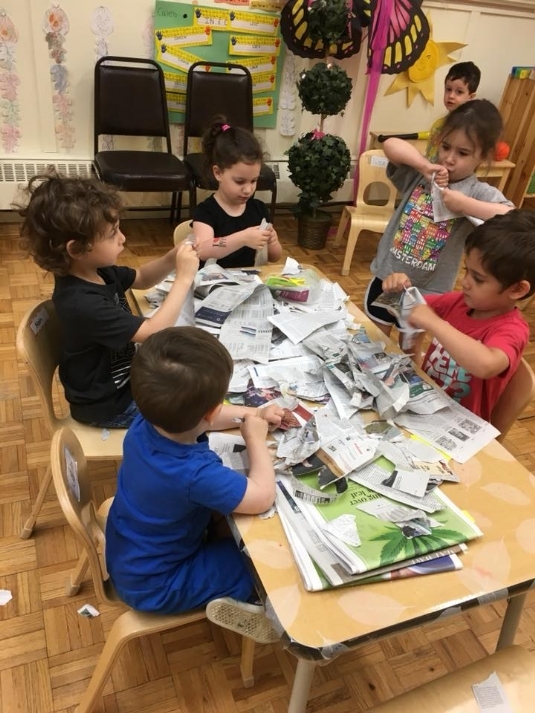 We worked together to build a class spring tree by crumpling tissue paper to make flowers and building a model tree with branches using blocks. Today we used our fine motor skills to crumple tissue paper and glue it onto our flowers. We also enjoyed exploring in our garden sensory bin by scooping up “soil” and finding “worms”. During circle we learned about the diamond shape and went on a diamond hunt around the room. We sung songs about kites and then made kites of our own! We also celebrated spring by dancing and moving with the parachute. We counted flowers and tried to number them in order as we planted them in their row. We also explored how to make rain in the sensory bin using some different tools. During circle we built mat man, and then practiced building the letter T. We then made our own letter T, trees! For science we planted some sage, rosemary, and garlic together and are excited to watch to see for any growth! 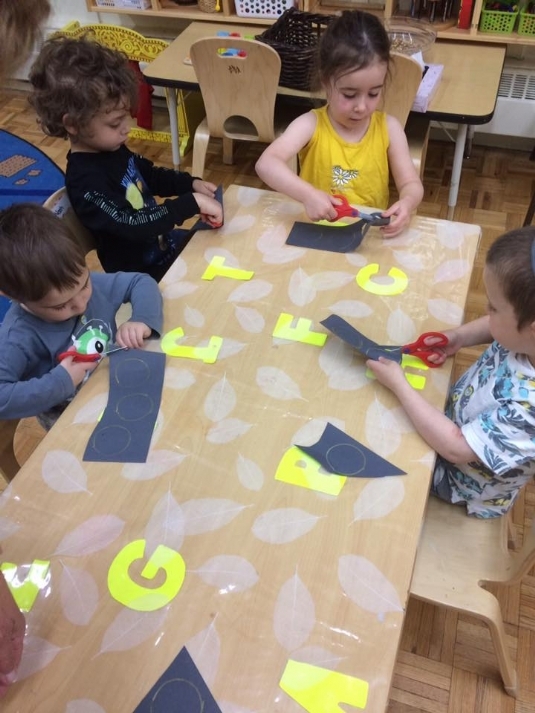 This week we were working on the letter “T”. We opened a fruit and vegetable stand, the kids enjoyed shopping. Coach Cory came and we had a blast. For sensory we played with slime And went digging in the sand box. For drama the kids were cooking in our egg soup in our restaurant. For art we finished our letter T turtles, and made flowers for spring by dropping water onto coffee filters. For art we also made trees with flowers out of tissue paper. During circle time we talked about what insects we see in spring. We had music with Maya as a special surprise, we loved her! 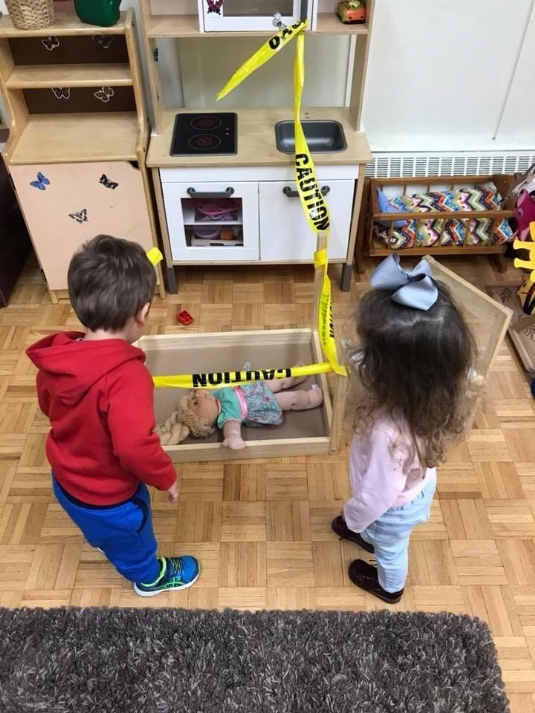 For drama we played with our transportation toys, spring flowers, and our kitchen. 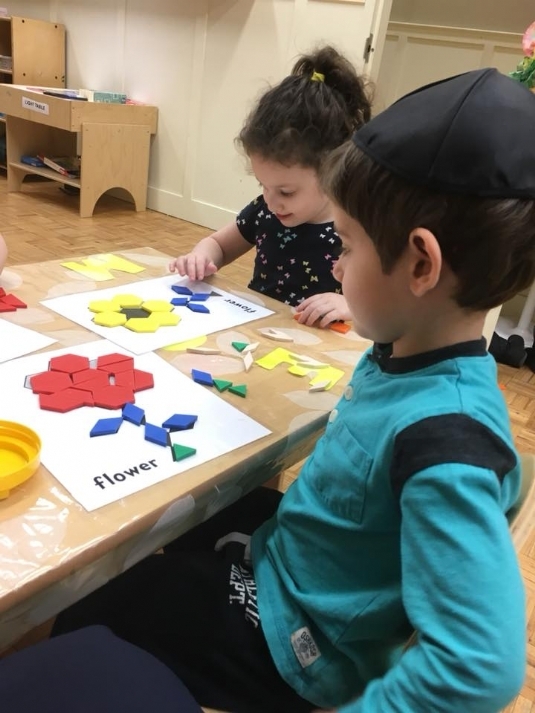 We counted flower numbers, and made flowers out of shapes.